Join the puffer fish fan club! 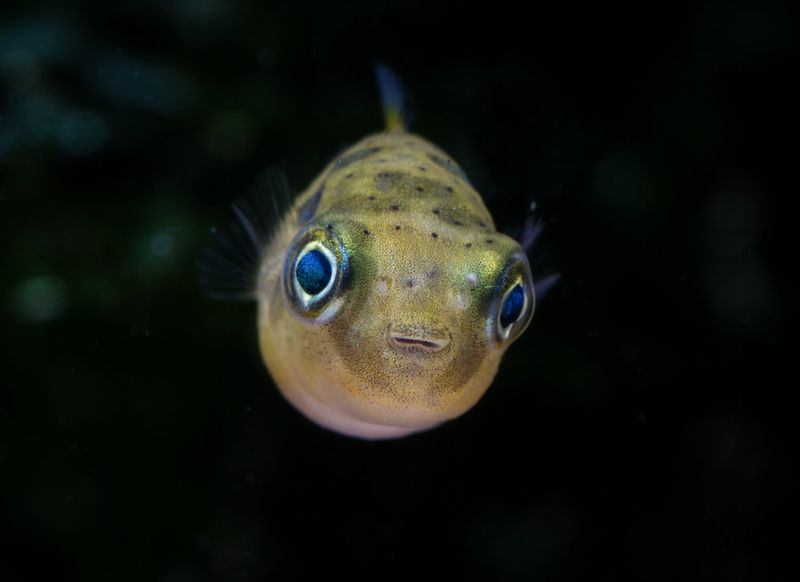 Just look at that little face... No wonder then, that so many fishkeepers find these little puffers so hard to resist. With their puppy-dog faces and almost comical swimming style, Dwarf puffers have instant appeal and are sure to become favourites with the whole family. truly great idea — one that requires immediate action! I was going through my usual morning routine, when I glanced over to the collection of my kids’ bath-time toys and there, on top of a pink hippo and a red whale, was a rubber porcupine pufferfish. It suddenly brought back all my pufferfish related memories from my time at the Blue Reef Aquarium. I remember being greeted by a friendly Turretfish, Tetrosomus gibbosus, every morning when I walked through the tunnel or being spat at by a large White-spotted puffer, Arothron hispidus, when I was too slow to feed it. Although these are marine species, there are freshwater puffers available with similarly interesting characters. I am always on a lookout for a new challenge, so there and then a decision was made: I had to keep puffers! On this occasion my idea was greeted with a big cheer from my children, who asked straight away whether they could see the fish puffed up. After explaining that puffers don’t blow themselves up just for fun and in fact they absolutely hate it, we agreed to not upset them. Some of the most well-known ‘freshwater’ puffers actually require brackish (salty) water as adults. I wanted freshwater only, ruling out the Figure eight, Tetraodon biocellatus; Green spotted puffer, T. nigroviridis, and Green puffer, T. fluviatilis. My other restriction was size. I planned to house them in a Superfish Home 80 tank, too small for species like the Giant Mbu, Tetraodon mbu, Fahaka, T. lineatus, and other African species. I further narrowed down my list based on availability and price, and ended up with a shortlist of three true freshwater species. South American puffer, Colomesus asellus. The South American puffer, Colomesus asellus, is a true river puffer, requiring fairly strong flow. They live in shoals in the wild, so keeping more than one shouldn’t be a problem. As they grow to 8cm/3.2in long, an 80 l tank is probably the minimum for a trio, especially considering their messy nature, but I planned to add a powerful external filter, which I was sure would cope. Their teeth may overgrow if no hard shelled food is given, but having plenty of tanks with flourishing snail populations, this wasn’t an issue. But I like fish with breeding potential and there are no reports yet of this species being bred in home aquariums. Although being the first has an appeal, I decided to stay on the tried route. The Red tailed puffer, Carinotetraodon irrubesco, on the other hand, offered some breeding opportunities. They are small bodied and good looking, and while they are twilight fish, the lighting could be timed to provide them with some moonlight when I’m around. Their big issue is aggression. C. irrubesco is not so bad, but it belongs to a group of four ‘red-eyed’ species, which all look quite similar and are often mislabelled in the trade. So there is a good chance that the relatively peaceful Red tailed puffer you order will be a more aggressive species, such as C. lorteti. Kept as a lone specimen in its own tank, this isn’t a problem, but housing more — especially two males — will lead to disaster. I had no store nearby which stocked these fish and I didn’t want to risk mail order for the above reasons. So I decided on the third species: the tiny Dwarf puffer, Carinotetraodon travancoricus. Bloodworm is a firm favourite with these tiny fish. Puffers are sensitive to nitrates, so watch your water quality when keeping these fish. Common names: Dwarf puffer, Pygmy puffer, Pea puffer. Scientific name: Carinotetraodon travancoricus (Car-in-oh-tet-ra-oh-don trav-an-cor-ick-uss). Origin: Kerala and Karnataka regions, India. Habitat: Slow moving rivers with dense vegetation. Tank size: 45cm upwards; volume 40 l minimum. Water requirements: 6.5–7.5pH, hardness 6–15°H. Feeding: For best results try a varied diet of frozen and live bloodworms, blackworm, Daphnia, Mysis, Krill, Cyclops, Artemia and mosquito larvae and see what they like. Ramshorn snails are always well received.Temperament: Depends on the individual, can be nippy. Availability and cost: Reasonably common, £3–£5. As they are messy eaters, good filtration is essential. Pufferfish, being scaleless, are also sensitive to high nitrates, so you have to aim for pristine water quality. This can only be achieved with multi-stage filtration, so I decided to add an external filter to help out the internal filter which came with the Home 80. With the decoration I tried to mimic the puffers’ natural habitat. I didn’t want a biotope, just something resembling a slow moving river. I used JBL Sansibar black sand as a substrate to imitate the sandy bottom. I decided to go with this dark sand to enhance fish colouration. As the rivers are full of fallen tree branches I looked into my ‘soaking barrel’ (when I collect any wood for aquarium use I keep it there for several weeks) and picked up a selection of wood. These pieces were randomly placed in the tank, creating a nice riverbank effect A large Bolbitis African water fern was added as a focal point along with smaller Java fern and clumps of Monosolenium (liverwort) attached to the ‘roots’. With the wood and plants, I created an underwater labyrinth, breaking up the line of sight and providing well separated areas for discovering or retreating. As pufferfish are quite inquisitive, they love to investigate everything. Therefore, some floating Water lettuce, Pistia stratiotes, was also added to provide shade as well as an interesting root structure. The decor was completed with a handful of dry oak leaves pre-soaked in boiling water to remove as much tannin as possible. Gabor's puffer set-up included plenty of wood and leaves to provide retreats and break up the line of sight. When the tank was properly cycled I added the first residents: a group of Kuhli loaches (Pangio sp.) Although it’s generally recommended to keep Dwarf puffers in species tanks I decided a ‘cleaner crew’ would help me remove the food bits these fish are so good at spitting out. The theory works well in practice, as the loaches happily collect the morsels dropped by the puffers and then retreat into their hiding places without getting nipped. A pair of Otocinclus was also added to keep the wood algae free. About a week after adding the loaches and the Otos, ten young Dwarf puffers were introduced. At first they were a bit shy, but quickly learned that the food came from me, so whenever I passed their tank the whole shoal rushed to the front glass, begging for something to eat. The problem was that this ‘something’ meant only two things: bloodworm or a snail. I’ve tried a range of frozen foods, but only a couple of the puffers tasted the Artemia, Daphnia or Mysis shrimp offered —spitting them out again in disgust. I have heard of Dwarf puffers accepting a range of foods, but my lot seem very conservative, not eating anything new. The only exception was live blackworm, which caused a feeding frenzy when I dropped a dozen into their aquarium — good news, as it should help me to bring my puffers into breeding condition. Take things a step further and try your hand at breeding these pea-sized fish. The Dwarf puffer is one of very few species in the family which can be bred in aquaria — there are even records of them doing so in a community set-up. Although my fish are too young to breed yet, hopefully I’ll be able to persuade them to do so in the near future. Fortunately, I know someone who has successfully spawned them on several occasions, and my plan is to follow his guidance as described below. You’ll need at least a pair of healthy and well conditioned puffers. Separating the genders is impossible at a young age, so it is always advisable to start your breeding project by buying at least 6-8 youngsters. As they grow you will see some of them separating from the group and guarding a particular area within the tank. Most of these separatists are young males, but you can only be sure when they develop a dark band on their undersides. This well visible sign is the key indicator of their gender. Mature females carrying ripe eggs have continuously rounded bellies (not only after feeding). When they are ready to spawn their visits to the bachelors’ yards will be more frequent. Dwarf puffers don’t build a nest, but they do need soft and fine leaved plants for spawning. If you have bunches of Java moss in your tank the dominant male is sure to take residence above them. Once an interested lady enters the love nest, males show their best sides to persuade her to lay the eggs. These fish are egg scatterers, so don’t lay their eggs in an orderly fashion as cichlids do. The eggs are relatively small and not sticky, so they will fall through the fine leaves to the substrate. After spawning, the male will guard the area, but not the eggs. In fact the parents may even consume them. If the spawning happens in the community tank — even in the case of a pufferfish only aquarium — the eggs and the newly hatched fry have almost no chance of survival, although there are anecdotes of tiny puffers arising from jungles of mosses. If you want to raise the fry, there are two options available: you can remove all the adults from the tank or try to syphon out the eggs (if you can spot them). Neither of these options are very practical or efficient, so setting up a separate spawning aquarium is best. It doesn’t have to be big, a 45 x 30 x 30cm tank will suffice. The decor can also be very simple, consisting only a double fist-sized clumps of Java moss. Substrate is not necessary, as the bare bottom will make cleaning and spotting the eggs much easier. For filtration an air-driven large sponge filter is perfect. Fill up the tank with 6.5–7pH, 5–8°H fresh water and set the heater to 25–27°C. For the best result it’s best to separate the males and females for at least a fortnight before attempting to breed them. Condition them with frequent feeding of varied live and frozen fare (or whatever they accept as food). Once they are ready, move one male with up to three females to the well cycled breeding tank. The male should soon realise the potential of the situation and begin chasing the females (remove any that are being over-bullied). Usually the separation of the boys from the girls increases desire, so spawning occurs within a week. For those who have bred egg scatterers like tetras, danios and barbs, the process may look familiar, but it may take several attempts to persuade Dwarf puffers to spawn, so don’t give up if you’re unsuccessful the first couple of times. 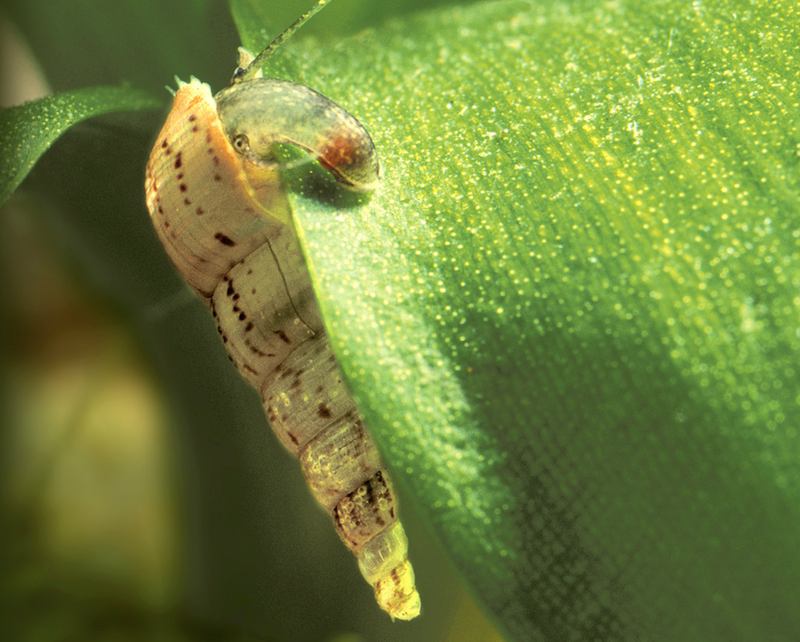 Once the eggs are laid, remove the adults and get ready for the hatching. You don’t need to rush, as it takes about 4–5 days. The fry rest on the bottom for at least another five days before going after food. As they are very tiny only the finest food will do, so get prepared with some Paramecia and infusoria, along with microworms. After a couple of days you can try some newly hatched brine shrimp. When the juveniles’ bellies turn to orange, indicating the consumption of a healthy dose of baby Artemia, you should have no further issues with raising them. Just keep up the frequent water changes and soon you can pass the excess fish on to friends so that they too can share the joys of being a pufferfish keeper! Set up a Kuhli loach hotel! Look closely and you’ll see not just danios in this set-up, but also Kuhli loaches out and about in the open. Steve Hunt’s Kuhli loach was in dire straits. The nano tank it had called home had been a present for Steve’s daughter, but it was woefully small. A curve-fronted little all-in-one lump of barely 30l/ 6.6 gal, it had become tired and grubby, hidden away in a corner, decrepit and embarrassing. My original offer was to overhaul the tank, revamp it and make it shiny once more. The centrepiece of the tank — the crowning achievement — was to be a tubular ‘loach hotel’. The idea was simple. A bundle of pipes was to be constructed into a large pyramid, with all the tubes facing the same direction. Any mixture was to be used — ceramic, plastic, old hose or miscellaneous. They were to be glued together, and then given a thatched roof of Java moss, strategically glued at key points. That was the plan. Then one morning a 102cm long Ciano Emotions Nature Pro tank turned up for review and blew all those early plans out of the water. I offered it to Steve to break in for me, and we went back to the drawing board. ‘How about a luxury, open plan apartment,’ I suggested, ‘with plenty of crevices and open spaces?’ Steve was sold on it. With the added swimming area, we plumped for a streambed tank with extra inhabitants. Kuhli loach are handsome but shy, and even a dozen or so in this tank could prove hard to spot. Give them too many hiding spaces and you’ll never see them. Don’t give them enough and they’ll never become confident enough to show as much as a whisker. Many a tank has ‘lost’ its Kuhli loach for years at a time, only found again when the tank is eventually stripped. Kuhli loach are Malaysian fish, so we wanted a tank with plants from that part of the world. That meant two easy targets appeared straight away — Cryptocoryne and Java fern. For tank mates, we needed something that could get on well with low flows. Kuhli loach hate high flows (which is handy, as the outflow of the tank’s filter is pretty mild), coming from slow moving, leaf-littered and often darkly acidic waters. A little head scratching and we came up with the idea of danios. While not entirely geographically correct, Brachydanio kyathit (from Myanmar) has enough overlapping requirements of water (soft, acidic, slow flowing) and temperature (best under the usual 25°C/77°F tropical catch-all) to live in harmony here. And given that they make their living at the middle and surface of the water column, they’d provide plenty of movement while the loaches were out of view. It was optimistically hoped that they might even act as ‘dither fish’, helping to boost the confidence of the loaches and encouraging them to come out more. We were pleasantly surprised when they did. 1. The cabinet was assembled and put into place with the tank on top. We placed it against a wall in close proximity to power sockets, and as we were on a ground floor, there was little worry about finding floor supports and positioning the tank across them. Once in place, a spirit level was used to check that it was sat squarely and evenly. 2. The filter was assembled. The Ciano filter uses a mixture of cartridges and foams. When constructing a filter, always ensure that things like carbon pouches are quickly rinsed, and that any media sealed in packaging for transport is liberated from it. Many a tank has failed because the biomedia was trapped in a plastic bag when everything was switched on! 3. Pre-washed silver sand is added and shaped into a mild slope, and the two largest foundational rocks added. The rocks cover a maximum of two-thirds of the tank for both pragmatic and aesthetic reasons — an open area allows for debris to accumulate and be removed more easily than if the whole base is decorated. 4. A third stone is added (and note the way that it has been placed, allowing for a broad cavern underneath) and a large chunk of bogwood added for both height and to reach out into the ‘open’ region. At a later stage, the wood may be used to house plants such as mosses or Java ferns. 5. Large Java ferns are added. I’ve taken the unusual step of keeping them in their pots and adding them to the base of the tank instead of tying or adhering them to wood. The pots are not placed deep in the substrate, allowing the root structures to still uptake nutrients. Planting Java ferns into the substrate can cause the roots to suffocate and die off. 6. Mixed Cryptocoryne are removed from their pots, have their roots trimmed and tidied, and are planted. Crypts are notorious for ‘Crypt melt’ after transit, and we kept them in large clumps for the first few weeks to see how they settled in. Once happy they weren’t going to die, we later divided them up into smaller plantlets and spread them over a wider area. 7. The tank is filled with water, using a colander to stop the inflow from stirring up the substrate, and everything is turned on. As the heater is not visible (it is hidden inside the filter), monitoring with a thermometer and adjusting over the following days is essential to get to the right temperature. We ran this tank at 23°C/73.4°F. The tank was matured using a mixture of ammonia, Evolution Aqua’s Pure Aquarium, and pre-seeded media hijacked from another aquarium. The cycle was rapid, just a couple of weeks before we were able to add fish, but this stage of the tank’s life requires scrupulous water testing to ensure that ammonia and nitrite levels are being controlled by the life support system. Scroll down for a video of the finished set-up. The big stones used here were bought from a garden centre as rockery stones. Though dusty, we tested them with a little hydrochloric acid to see if they ‘fizzed’ and they did not, meaning that they do not contain any water-hardening calcium carbonate. The wood we tried here was dense, perhaps the densest I have used in a tank. On this rare occasion, it did not require prior soaking, but you will likely find that any wood you use will need to be placed in a bucket of water for a week or two before use. The rounded rocks we used could easily be replaced by large flint cobbles. I’d be wary of using one of the large ‘resin type’ fake stones in this role, as these are hollow and you’ll soon have more Kuhli loaches inside it than out of it. Scientific name: Pangio semicincta (Pan-ghee-oh sem-ee-sink-tah). Habitat: Slow moving forest streams and static bodies of water, often acid-soaked and discoloured. Little, if any flow. Water requirements: Soft, acidic water; 4.0 to 7.0pH, hardness 1–8°H. Feeding: Loves frozen and live foods like Cyclops, Daphnia, Tubifex and bloodworm. Temperament: The most peaceful fish there is. Availability and price: Widely available, starting from around £2.50 a fish. Buy in bulk for reduced prices. We bought 12 specimens for this set-up from the Waterzoo in Peterborough. These are small fish that need a big tank, like many of the ‘danio’ varieties. Once settled, this has to be the brightest of the family, with its fiery orange flanks. Kyathits prefer tanks with plenty of plants, and if you can’t get lots of greenery then at least go for a dark substrate, otherwise you’ll end up with pale fish that hide their best colours away. Invest in some colour-enhancing foods and Calanus to keep those markings intense. Scientific name: Brachydanio kyathit (Brak-ee-dan-ee-oh kye-ath-it). Habitat: Slow moving streams with heavy planting at the banks. Water requirements: Soft, acidic water; 6.0 to 7.5pH, hardness 1-8°H. Feeding: Will take flakes, but also offer plenty of frozen and live meaty foods like bloodworm and Daphnia. 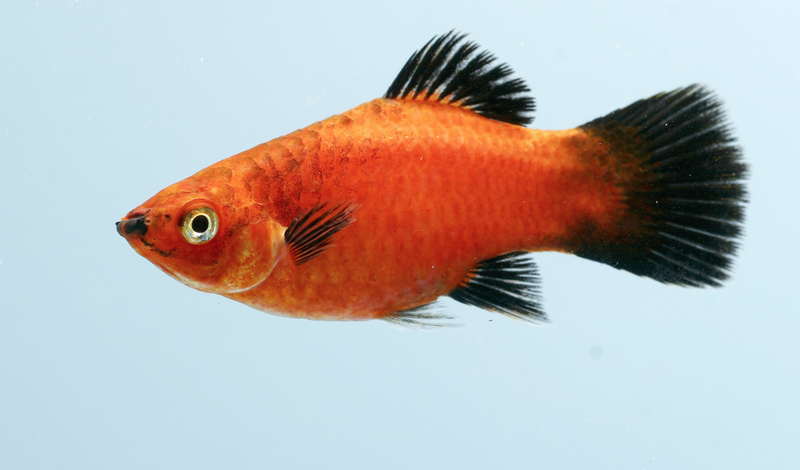 Temperament: Incredibly peaceful and a perfect community fish. Availability and price: Increasingly available, with prices starting around the £2 mark. Collect fallen leaves this autumn to provide natural — and free — decor for your aquarium. Make the most of the autumn season by collecting leaves for use in your aquarium and discover the benefits to both your fish and your bank account. When, quite some time ago, I inherited a small group of Wine-red Betta, B. coccina, I didn’t know what a task and responsibility I had taken on. After a quick search of the available literature, I realised they originated from Asian peat swamps and prefer soft and dark — almost black — waters with leaf litter. As I’d never had a fish before with similar requirements, I assessed my options. The first was to buy a ready-made black water tonic to add to their tank. The second solution was to get some imported Catappa leaves and use them to recreate the natural habitat. The final, third option was to collect fallen leaves from a nearby forest and use those instead. This latter choice was also the cheapest and as I was on a very tight budget at that time, I opted for gathering oak leaves. Fortunately, I had a week to prepare the tank for the Betta coccina, so when they arrived I greeted them with perfect water conditions. Since then I have kept several other leaf-litter-loving fish and — especially since becoming involved with shrimp keeping — I have learned a lot about the different leaves and their potential uses in the aquarium. So, I’d like to offer you some guidance on choosing and using them in your fish or shrimp tank. Many leaves will give the aquarium water a tea-coloured hue. Image by George Farmer. Many of our favourite fish originated from waters flowing through dense vegetation and forests. The constant supply of falling leaves will colour the water tea brown, sometimes almost black. One of the culprits of this is an organic compound called tannin, which can be found in different quantities in most of the dry leaves. It is also a weak acid, which can reduce the pH of the water. The tannin is most effective in very soft waters, as the buffer capacity of hard waters can easily neutralise its acidity. Most of the black water species require soft water anyway, so with a carefully selected leaf you could achieve two goals at the same time: a nice, dark water and low pH without a need to use chemicals. As well as tannins, some leaves also contain other organic compounds that could tackle fungal and bacterial infections without the need to use medications. Catappa (also known as Indian almond or Ketapang) leaf is widely used by fish farmers and exporters in the Far-East to reduce stress and cure diseases. The leaves of the Walnut tree — if collected green and then dried — have similar effects and are very popular among shrimp breeders. This killifish set-up includes leaf litter on the base. Leaf litter can also help shy species, such as Liquorice gourami, Parosphromenus sp., to settle down easier. It provides perfect places to hide, especially if you are using naturally dried, curled leaves and not the flat-packed commercial ones. Even cory cats love to play hide and seek among them, often choosing the larger leaves for depositing their eggs instead of the sides of the aquarium glass. And we mustn’t forget about the use of leaves as decor. While not everyone’s cup of tea, certain biotopes require leaf litter. If you don’t want tea-coloured water, choose a leaf that will not colour it (or boil and soak them for a while before use). For decorating reasons you have a wide choice of large (Plane tree, Turkey oak, Catappa), medium (Oak, Hazelnut) or small (Beech, Silver Birch, Hornbeam) leaves. Leaves provide a perfect grazing ground for shrimp. Leaves can play an important role as a grazing ground for young and adult shrimp, and Mulberry is widely known as an excellent shrimp snack. The biofilm growing on the decaying leaf surface will also be appreciated by the fry of several fish species, acting as their starter food. Fresh leaves of several plants — for example blanched Spinach, Dandelion and Stinging nettle — can also be used to feed fish and shrimp, although in this article I will concentrate on ligneous (woody) plants only. Most aquarists in the UK have heard of the Catappa leaf and some are familiar with its beneficial effects. If asked about British tree species useful for aquaria, most will probably mention Oak or Beech, but few will have tried any others. A couple of years ago I met Gabor Csepanyi in Hungary, who became an “advocate” of using leaves and other parts of domestic plants instead of imported ones. He believes it is a more eco-friendly and also wallet friendly option. A discussion with him and the results of Istvan Toma’s research investigating the effect of different leaves on water parameters, have opened up my eyes to see a world of local leaves with possibilities too good to miss. So get out there, and get collecting! Autumn is the perfect time to top up your leaf stock. By this time all the unwanted compounds (sap, protein, chlorophyll etc. ), are removed from the dying leaves by the tree. The tannin concentration on the other hand is increased — it can be 3–4 times higher than in the green leaves. Don’t collect leaves from a roadside, or other polluted areas. If you live in a big city, it’s time to visit the countryside! Do pick only healthy, undamaged leaves — watch out for bite marks, discolouration or deformations. Do try to collect the leaves as soon as they have fallen (try to beat the rain) to avoid the bleaching out of the valuable compounds. Don’t collect overwintered leaves in the spring, unless you only plan to use them as decoration (but even then they will not last for long). Do dry the leaves as soon as you can after collection — just spread them on a tray over a layer of paper kitchen towel. I prefer curled up leaves, but if you want flat ones you need to use a press (a couple of books would do). When fully dry store them in a paper bag or box in a dry place. Some leaves should be picked green and then dried for storage. In this state they can store valuable nutrients or useful organic compounds, so they are mainly used as food or as an antibacterial and antifungal water treatment. But a word of warning: be very careful with the dosage of green dried leaves, as overdosing them can lead to cloudiness and a deterioration of water quality. Leaves of the Mulberry, Morus sp., are considered among the best shrimp foods, but are also readily taken by plecs. The green leaves are high in protein and have excellent nutritional value. If used properly they will not modify the water parameters. Walnut, Juglans regia, leaves are famous for their very positive effect on the health of fish and shrimp. They can cure bacterial and fungal diseases and reduce stress just like those of Catappa, but will not lower the pH and colour the water to the same extent. All the leaves listed below should be collected in the autumn after they have fallen (naturally) from the trees. There are several oak species in the UK, ranging from the relatively small-leafed English oak, Quercus robur, to the Turkey oak, Q. cerris, with its palm-sized leaves. They differ in leaf size and shape, but all contain a relatively high level of tannin, which makes them one of the best natural pH reducers. They will also colour the water a medium brown, so they’re not a good choice if you want to keep your water crystal clear. Otherwise the oak leaf is a very easy to find and versatile option. The Beech, Fagus sylvatica, has quite thin and small leaves, which usually only give a faint yellowish tinge to the water. It will only slightly reduce the pH. Due to its small size, it is very suitable as leaf litter for a nano or shrimp tank containing species requiring a pH that’s close-to-neutral, such as Cherry shrimp, Neocaridina species. Despite being widely used in urban parks due to its tolerance of air pollution, not many would recognise the Hornbeam, Carpinus betulus. Its small leaves can punch over their weight: the acidifying effect is very similar to that of the Catappa leaf. You might need more Hornbeam leaves to achieve the same effect, but based on weight they can equal their Asian counterpart. They will lower the pH very quickly, so be cautious when using Hornbeam leaves, so as not to stress your livestock. The best way to do it is to drop in a couple of leaves (depending on the size of your tank) every day until you reach the desired effect. It will also give the water a nice brown shade, which is an additional bonus if you want to achieve that black water look. The Silver birch, Betula pendula, is easily recognisable because of its silver-white bark. It also has small leaves, but won’t alter the pH or the colour of the water. The rigid dry leaves are very slow to decompose, making them an ideal choice if you want to keep your water crystal clear but still use leaf litter for decoration or hiding places. If you need slightly bigger, but similarly long lasting leaves with only a mild colouring and pH lowering impact then it is worth considering the Hazel, Corylus avellana. It has thick and rigid leaves, which are usually left alone by algae eaters and shrimp, so can serve as a durable decoration. Sycamore, Acer pseudoplatanus, leaves are one step up in size to Hazel, but have a strong and quick colouring effect. They bleach out quite quickly and the remaining semi-transparent leaf blades will serve as a delicious snail or shrimp food. The pH reducing capability is also short lived, and after the initial sudden drop it will rise again. larger fish tanks, as it only has negligible influence on water colour and acidity. Good for your fish and good for you! Collecting leaves offers an excellent opportunity to get your partner and/or kids involved in your hobby. Who would resist an offer to visit the nearby country park or forest on a beautiful and sunny autumn day for a healthy walk? My children certainly enjoy collecting fallen leaves — they can fill up my store very quickly. You can simply drop the required amount of dried leaves into your tank, but if you want them to sink faster you can pour boiling water over the leaves before you add them. This is also useful if you want to reduce water discolouration in your aquarium. How clean is your bottom? Gravel looks natural and is reasonably cheap to buy. But it does need regular cleaning, especially if you have bottom-dwelling fish like catfish and loaches, that spend much of their lives in contact with the substrate. The type of substrate you decide on will have big effect on how much time you’ll need to spend on its maintenance. Our guide will ensure you stay on top of what’s on the bottom. Different types of substrate need different approaches when it comes to cleaning. If you’ve gone for bleached white sand under a barrage of intense lighting, you’ll probably need to be in there, sifting away daily. If you’ve gone in for a planting substrate, you might never clean it, once. Here’s how to deal with some of the more readily available substrates out there. Controversial, but if you have a tank decked out with high-end, high cost planting substrates like ADA Powersand, you either know what you’re doing or you’ve made a big mistake. Planting substrates are mainly designed to trap and slowly release nutrients to plant roots, and often come pre-loaded with food — that means ammonia. The moment you start trying to rake through them, you release those nutrients into the water column, and that in turn will lead to an outbreak of algae. Before going in the tank: Usually you don’t! Once in the tank: Some aquascapers suggest removing a section of the substrate every few weeks or months, and cleaning before replacing. Others don’t. My own advice is to run a gravel cleaner about an inch above the surface of any exposed parts, so that you lift any waste without disturbing the substrate itself. Heaving with nutrients and perfect for almost all kinds of plant growth. Useless for burrowing catfish or excessively dirty tanks. Limited choice of colours and grain size. Often tends to have a slightly acidic (and rarely alkaline) influence on water chemistry. Some modern aquarists might be a bit sniffy about this ‘outdated’ substrate, but it still has its place — by which I mean it is a total breeze to clean. Gravels, and most famously the classic ‘Dorset pea gravel’ became a hobby staple during a time when tanks relied on undergravel filtration. Subsequently they have found themselves on the fringe of fashion, but many tank owners still persevere! Before going in the tank: Rinse thoroughly to remove any fine dust. A sieve is fastest, if you blast around 1 or 2kg at a time under a coldwater tap, shaking and swilling like chips in a fryer. Alternatively, place into a bucket and stir continuously while applying running cold water and letting the bucket overflow. Ensure the water is running off clean before draining and adding to the tank. Once in the tank: Use a gravel cleaner with syphon to draw water out of the tank and plunge the gravel cleaner deep into the gravel at the same time. The water will lift the gravel, swill and rinse it, then when the gravel cleaner is lifted it will drop back out. A battery or air powered vaccum will do a similar job, but less effectively. You’ll need to do this at least every two weeks, though weekly is considerably better. Monitor how dirty the gravel is each time and adjust as needed. The easiest gravel to clean by a mile. Inert in freshwater, rarely causes a slight alkaline elevation. Looks good in many settings. Hides obvious small particles of waste from view. Awful rooting medium for most plants. Can harm catfish bristles and burrowing species. Improper cleaning will lead to nitrate spikes and disease hotbeds. Silver sand is the choice for numerous biotopes, as it’s similar to substrates found in lakes and rivers the world over. It can be bought in almost any aquatic store, and similar looking substitutes like playpit sand are available where it isn’t. Despite some detractors claiming potential gut or gill problems associated with using it, it remains one of the most popular modern substrates going. Before going in the tank: Slowly, slowly is the key here. Place around 5–8cm depth in a bucket at a time, and stir continuously and vigorously while flushing with cold water. Note, this stage may take a long time, but you need to be thorough as it is hard to remove sand dust once it is in the tank. Don’t try putting it in a sieve as you’ll lose the lot! Once in the tank: A gravel cleaner and syphon will just lift the sand out of the tank, though you can use that to your advantage. When particularly dirty, it may pay to remove some sand with a hose this way and rinse it as though going in the tank for the first time — just be careful to limit this to 25% of the total sand, in order not to disrupt filtration. Personally, I like to gently rake my fingers through silver sand on a weekly basis, allowing any muck to lift and drop back down to the surface. Then using a syphon hose, I skim just above the surface of the sand, removing the deposits. This method will result in a fractional loss of sand, which is cheap enough to replace as needed. Great for catfish whiskers and fish that burrow. Almost always inert, doesn’t affect chemistry. Many plant roots love it. Cannot be used for deep substrates as it can turn anaerobic. Can look dirty very quickly. Can find its way into filters easily. Excitable fish may stir up a tank into a sandstorm. Strong filter flows may move it, leaving craters and sand drifts. Love them, hate them, ignore them, but coloured gravels are often part of the appeal for a new fishkeeper. Not all coloured substrates are the same, either in size, quality or durability, so even cleaning for the first use can be a disappointment. Before anything, get some of your proposed gravel, put it in a jug with some water, give it a couple of days and test for ammonia. Some coloured gravels are reported to leach ammonia compounds, and if they do, I’d personally bin them — or you can soak them until it goes away. Before going in the tank: Rinse gently in a colander or sieve under gently running tapwater. In many cases, some of the colour will run off, leading the aquarist to panic and stop rinsing. You need to keep going until the water runs clear, but do be gentle! The same problem will arise if placing the gravel in a bucket and stirring while gently flushing. Note that some gravels come coated in a resin that will hold in the colour, and for these you can be vigorous, though paradoxically they’ll be amongst the cleanest out of the bag. Once in the tank: Gravel cleaners and syphons will need to be used at least weekly to keep coloured gravel clean. The lighter the colour, the quicker algae will start to smother it, and you may find that white gravel only lasts one or two days before needing syphoning again. Be particularly careful with black gravel as it can harbour a lot of solid waste without you noticing, and may turn your tank into a ticking time-bomb of sewage. Pretty, if you like that sort of thing. Easy enough to clean once in place. Some fish will freak out over bright substrates. Some types may contain ammonia sources. Colours may bleach over time. Coarse grains will affect catfish and burrowing fish. Can get dirty very fast. Coral sand has a limited use these days, being restricted to marine set-ups, and hardwater tanks (usually African). It’s actually the product of fish that eat corals, and pass the tiny coral ‘sand’ fragments out in their faeces. Because it is riddled with calcium carbonate, it will make soft water hard, and subsequently alkaline. Never be inclined to use it in acidic tanks! Before going in the tank: Place around 5–7cm of sand in a bucket and flush with cold water while stirring vigorously. Ensure all the sand is turned over as you do this. When the water eventually runs clear, the sand is ready for use. Once in the tank: Use a gravel cleaner and syphon weekly or fortnightly and clean as though you would fine gravel (see previous page). In between syphoning sessions, waste from the surface can be removed with a battery powered gravel vacuum, or by wafting a fine net above it and lifting out any waste. Acts as a buffer in hardwater tanks. Fine enough for some burrowing species such as eels. Very attractive in the right setting. Intense light will cause algae growth. Useless in acidic and softwater tanks. Some grades can be very dusty initially, requiring prolonged cleaning. Fine particles are sometimes implicated in gill problems in some fish. Never leave the roots of plants behind when extracting them, as they’ll decompose and churn out nitrates. Rather than pulling plants out, try digging them out. Use nets to remove uneaten food and debris rather than letting it settle on the base. For marine tanks, lay your sand out thinly on a tray and run over it with a powerful magnet before use. It’s rare, but occasional metal fragments in substrates are not unknown. The joy of snails! While poorly managed snail populations can become epidemics, having a few Malaysian trumpet snails among the substrate can help turn it over and prevent stagnant patches. Green dust algae is more common in new tank set-ups. Image by Nathan Hill. Any tank you ever set up will be subject to an algae outbreak sometime. The trick is to learn to manage, rather than completely eradicate it. Every newcomer to the hobby will be united in asking, somewhere around three or four weeks into their experience, about how to deal with the algae forming in their tanks. It’s no coincidence that some tanks are hit harder with the green stuff than others. Algae are numerous in their forms, from microscopic green ‘orbs’ that drift like balloons, to long, pernicious strands of red or black that carry the resilience of a born survivor. The basic algae problem involves a tank full of water, light (which supports plant life), nutrients (either too much or too little) and carbon dioxide (which may or may not be in your control.) Wherever these ingredients are found, they present an opportunity for algae to grow. and red varieties, needing different handling approaches, plus the peril of ‘algae’ that isn’t even true algae. It’s important to diagnose and understand what type you’re up against before you decide on what action to take against it. Where are the fish? Green water in an aquarium. This is quite a rarity in tanks (as opposed to ponds) unless you’re tampering with carbon dioxide and nutrient levels, but it can still strike out of the blue. The cause is a unicellular alga that lives free in the water, too small to get trapped in filters, and too persistent to be diluted out with a simple water change or two. Ammonia is implicated in causing and sustaining green water, and stirring up substrates, subsequently releasing ammonia in to the water, can be a trigger. Off the shelf algaecides may help, water changes do very little, and my own experiences have found that a temporary black out where lights are turned off and the tank shrouded to keep out any external light will help reduce it, but not always eradicate it. To add to the frustration, it will often disappear in a day or two entirely on its own. given time to cement itself in place it can be stubborn. Attacking it frequently seems to make it linger, and aquascapers will sometimes just leave it alone for several weeks (until the glass becomes near impossible to see through) before removing en-masse by scraping it from the glass with a blade or plastic edged cleaner, and then syphoning out the removed algae from the base. Oddly, in heavily planted tanks, a low level of nutrients can be part of the cause, but unless you’re a dedicated aquascaper you won’t want to add more plant food! Not a true algae, but a bacteria, blue green algae can be a nightmare to control. Image by George Farmer. If you suffer from this, then I feel for you. Blue green algae isn’t algae in the true sense, but is a type of bacteria that can photosynthesise. It will quickly drape all that it can in a tank with thin, expansive sheets that often peel away in large pieces. Controlling it is nightmarish, and short of using antibiotics (which are illegal without prescription in the UK) you’ve a long fight on your hands. In a home tank, the cause is usually a combination of direct sunlight hitting the glass, combined with dirty substrates that harbour rich beds of organic matter. Ammonia can trigger it, and a new tank is likelier to get it than an old one. To start controlling it, you need to physically remove as much as you can via net and syphon. At the same time, you need to work on substrates to get them scrupulously clean, as any muck down there will entice it to return. To eradicate it, you’ll need a complete tank blackout for around four days, so turn off all lights and wrap the tank in something dark so that light can’t get in. It’s noted that increasing oxygen levels can also help out, so get an airstone in the tank too. Brown algae is common in newly set up tanks and usually disappears on its own. This is the most common alga you’ll meet, and it’s formed of tiny diatoms. If you’ve set up a new tank, it’s the first alga that will appear, and is associated almost entirely with the silicates and ammonia that goes hand in hand with an unestablished system. Brown algae will vanish within a few weeks of setting up. If it doesn’t, that algae isn’t the problem, but rather something is stifling the maturing process of the tank. It may be an issue with the filter, or it may even be excess movement of the substrate. Stirring the base up too often can cause it to linger, but only when the tank is new. Though some fish (like Otocinclus) will eat it, the paradox is that brown algae will almost always indicate a tank too immature to keep them. Clean and wait, and eventually the algae will go. Brightly-lit tanks with low flow are more at risk of green spot algae. Image by George Farmer. Not to be confused with green dust algae, green spot is more tenacious and stubborn, with larger individual blobs. In aquascapes, it tends to be associated with low CO2 and low nutrient levels, where in most domestic community tanks it tends to be a consequence of excessive lighting and poor water flow. Bright, near-static tanks are almost always problematic. To clean from glass, hard scrubbing with a pad or magnetic cleaner will keep it in check, though a razor or plastic edge may be needed to remove it once it gets a foothold. Green spot algae on decoration will require scrubbing with a toothbrush. Remove affected decor and brush it under running water. Leaves showing coverage of spots are best removed using sharp scissors. Performing a series of small water changes (10% daily for five days) may help to reduce some of the available nutrients. Cut back on the amount of light during the day — anything over eight hours is inviting green spot. Black brush algae grows on any surface, but is particularly fond of wood. Image by George Farmer. ‘Black’ algae is misleading, as this is actually classed as red algae. In the tank, it tends to be more of a sooty grey, but its presence is unmistakeable. Small, beardlike tufts of dark, fluffy algae will jut from all surfaces, ornaments and plants in a slow encroachment, until eventually the whole tank is smothered. It’s associated with a few factors in community tanks. High phosphates are implicated, as is inadequate flow of water. Old light tubes in particular seem to promote its growth, and fluorescents over 12 months of age should be replaced to prevent it. It can often be found living directly on wood, feeding on leeching organics. Controlling it is nightmarish. Any plants that show signs of infestation should have the affected leaves sacrificed immediately. Any growths on glass should be scraped away with blades or plastic edges, and the tank syphoned to removed the fragments immediately after. Decor that is smothered can be treated by removing it from the tank and soaking it for five minutes in a mixture of glutaraldehyde (such as Easycarbo, or Flourish excel) at a ratio of 25% treatment to 75% water. After soaking, rinse thoroughly before returning to the tank. Dosing Easycarbo to the tank will help to control brush algae in the long term, as it’s toxic to the algae but not to higher plants. Water changes will help in some cases, while less water changing helps in others, as will certain fish and shrimps. Try redirecting filter outlets to provide more flow around the tank, or even consider an additional small pump or powerhead to increase movement. Tanks lacking maintenance are a magnet for staghorn algae. Image by George Farmer. Looking similar to black brush algae when small, staghorn forms long, antler-like tangles. It tends to prefer plants over substrates or decor, smothering leaves with its growth. Dirty tanks with sediment trapped in the substrate are desired real estate for staghorn, and toss in slow water flow and ageing lights, and you’ve a perfect recipe for growth. Cleaning the substrate, removing affected leaves, and treating with glutaraldehyde will all help, as will improved flow rates. Bristlenoses (Ancistrus) catfish are relatively small at around 10-12cm fully grown, and peaceful. They’ll help to reduce levels of spot and dust algae, but will avoid brush algaes. Excellent, hard little workers. 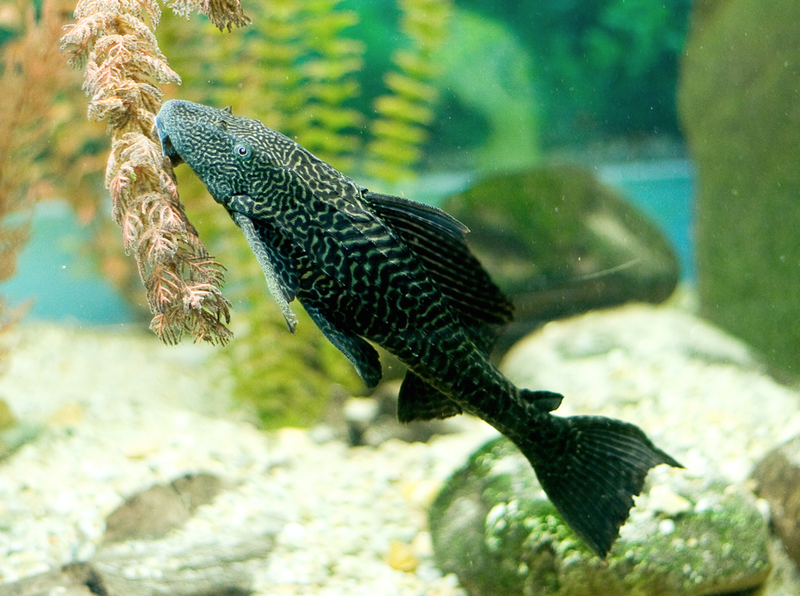 Marketed as ‘the’ algae eater, Common plecs will rapidly outgrow most home tanks, and eventually become lazy, preferring commercial fish foods over algae grazing. Not a good choice. American flagfish, Jordanella floridae, like to nibble at tufts of algae, and they’ll even tolerate an unheated tank of 18°C/64°F or so. On the downside, they’re waspish in a community and prone to nipping tank mates. Not to be confused with the larger Flying fox, Siamese algae eaters, Crossocheilus langei, are one of the few fish that will graze brush algae from leaves while leaving plants untouched. Fancy platies, as well as their swordtail and molly cousins, are known to nibble at the fringes of algae growth. Tiny Otocinclus catfish need to be kept in a shoal to have any effect. They clean glass, leaves and decor for brown and green algae, but won’t touch hair algae. Combine with Amano shrimp to cover all angles. Amano shrimp will eat almost anything with the exception of cyanobacteria, but to have an impact you’ll need quite a few of them. So-called ‘pest’ snails are actually good at controlling algae levels, though their populations explode if there’s an abundance of food for them. Will Checkerboard cichlids suit my set-up? Can I keep a turtle with a puffer? What is this strange thing in my tank? The International Aquatic Plants Layout Contest saw a record number of entries this year. Here are some of the aquascapes that made it into the top 20 along with the judges' comments. Check out the February 2015 issue of PFK for this year's Top 7. Aquarium: 120 × 45 × 40cm/48 x 18 x 16in. plants mainly using epiphytic and tape-like species produces a natural feel. Large angelfish make this aquascape more powerful and impressive. 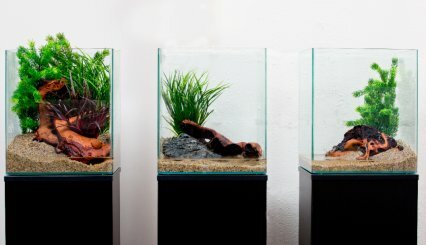 Aquarium: 120 × 45 × 45cm/48 x 18 x 18in. depth to the layout and further emphasises the stone composition. Aquatic plants used match the texture of the stones. Aquarium: 150 × 55 × 45cm/60 x 22 x 18in. Comments: Thin trees stretching the length and breadth of this layout are reminiscent of ivy and aerial roots hanging in jungle. The trees are entwined so that not even a hand can get through, giving an impression sight of untouched nature in a lush jungle. Two lines of cosmetic sands followed by an open space add a bright touch. 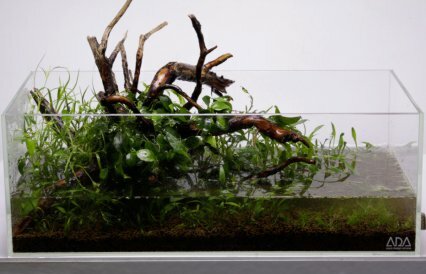 Aquarium: 114 × 52 × 52cm/46 x 21 x 21in. Comments: The use of different colours of aquatic plants is impressive. The contrast of bright red stem plants and dark green mosses is very beautiful. The composition surrounded by stones produces a unique visual effect and the shade of stone firms up the impression of the aquascape. Sawbwa resplendens add grace to the aquascape. Title: Meet up the winds. Comments: This layout depicts a realistic landscape of a lake surrounded by forest and sheer rock mountains. Perspective is emphasised by the contrast of the large tree in the left front and the forest at the back, creating the illusion of a natural landscape. It feels undeniably odd to see fish present in such a terrestrial landscape. Title: Great waves of wilderness. Comments: The repeated use of driftwood in the same pattern is impressive. Perspective is emphasised by the contrast of large driftwood in the front at both ends and very small pieces at the back in the centre. Mosses attached to the driftwood create a unique atmosphere reminiscent of dense wood. Title: The world behind peacefulness. 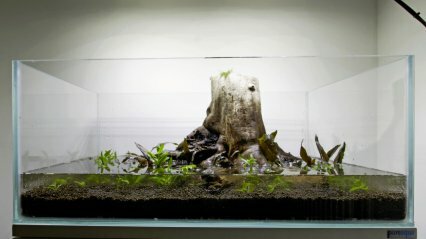 Comments: An aquascape is expressed using driftwood and stem plants. This layout uses a classic concave composition, but a depth is naturally created towards the open space by the driftwood arch in the centre. Aquatic plants are n a good balance and the fish match the aquascape well. Aquarium: 120 × 40 x 50cm/48 x 16 x 20in. Comments: The combination of stones and driftwood gives a wild impression. The layout is broadly divided into three parts, and perspective is expressed by making the centre a near view while the both right and left sides create a distant view. The use of mainly epiphytic plants such as mosses and ferns emphasises the wild feel of this layout. 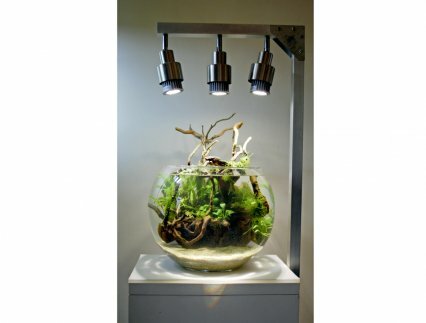 Aquarium: 90 × 45 × 40cm/36 x 18 x 16in. Comments: Perspective is skillfully expressed by a bold arrangement of driftwood and winding flow of cosmetic sand. The planting and the combination of stones and driftwood are very natural. The fish also match the atmosphere well. However, the aquascape would have looked more natural without the waterfall. Aquarium: 120 × 60 × 60cm/48 x 24 x 24in. Comments: The composition, made of a bold arrangement of large driftwood, is powerful and effectively expresses the perspective. Splendid balance of colour is achieved with reddish wood, white cosmetic sand and green aquatic plants. The use of roundish stones skillfully expresses a river bottom. Aquarium: 180 x 60 × 50cm/72 x 24 x 20in. Comments: This layout is reminiscent of scenery of Guilin, China. A landscape of many odd-shaped rocks is depicted by standing stones in a panoramic aquarium. Expressions of landscape and aquascape are perfectly blended. Aquarium: 120 × 50 × 50cm/48 x 20 x 20cm. Comments: This layout uses stones featuring characteristic red and white stripes. A terrestrial landscape is skillfully expressed by the arrangement of different sizes of stones to emphasise perspective. With the effectively planted mosses, the exposed stone surface looks exactly like a real cliff. 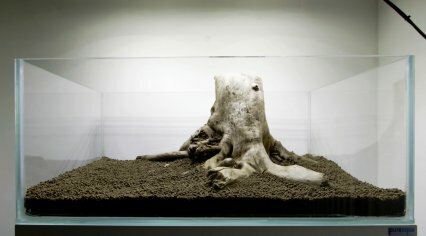 Aquarium: 124 × 48 × 56cm/50 x 19 x 22in. Comments: Skillfully depicts a natural feel using stones and driftwood. The shadow below the stones and the driftwood entwined around the stone add a natural depth. Well-balanced composition, effectively-made open space and cosmetic sand create perspective and flow of water. Weâ€™ve done the unthinkable! Weâ€™ve advocated using a goldfish bowl! However, James Starr-Marshall assures us that no fish have been involved in this unusual kind of set-up. When PFK editor Jeremy Gay said he had an aquascaping project for me, I was surprised to be handed a traditional goldfish bowl. In view of all we’ve done to ensure fish are kept correctly, it seemed strange to be holding an object causing so much trouble in the fishkeeping world. In the 1980s real concerns were raised about the ethics of keeping fish in such containers and led to several campaigns. By the 1990s most aquarium shops had stopped selling them and the goldfish bowl had become a symbol of bad fishkeeping practice. The miskeeping of fish did not end with the goldfish bowl and there are still irresponsible fishkeepers around. The goldfish bowl in itself is not cruel —more so the suggestion that in it we should keep a fish that potentially grows to 30cm/12”. There are obvious issues when using a goldfish bowl as a home for aquatic life. The traditional one is a 12” glass sphere with an 8” diameter opening. This gives a total volume of just 13.5 l/3 gal, placing it on the cusp of the nano and pico categories — and that’s a particularly challenging arena in which to operate. The unusual shape means that so small a surface area is in contact with the air that gaseous exchange will be about half that of a tank with a full-width opening. Even with a filter I believe the bowl is unsuitable for all species of fish — and even any shrimps should be stocked with caution. These limitations considered, there’s still a number of ethically sound projects to keep a hobbyist entertained, especially if interested in creating plant-only systems. As an aquascaper experienced in nano and pico aquaria I couldn’t resist the temptation to install as full a 'scape as I could. The challenge of creating an aquascape within a spherical aquarium became particularly apparent as I started to try out some hardscape materials. My attempts with rockwork resulted in adding ever more sand to ensure a larger base area until the bowl was almost half full of substrate and I had no usable height. I decided to postpone using rocks until I had the time and epoxy putty to build a formation and instead experimented with wood. With careful selection and a hacksaw I tailored a nice piece of Redmoor root so that it would rest comfortably on the base of the bowl. The rest of the wood branched and twisted out into the widest points using a good portion of the space in the bowl. Happy with this arrangement, I was delighted to realise that I could tie all my chosen plants to the wood outside of the bowl, alleviating the need for any fiddly planting through such a small aperture. For the plants I opted for a TMC CO2 set, Tropica Premium fertiliser and a DIY LED lighting rig I made from an old spotlight fitting. The whole lamp holder assemblies were unbolted from the ceiling mounting plate. They could then be rebolted to an ‘L’ shaped arm made from two pieces of square aluminium tube. Making the lighting is not difficult if you have reasonable DIY skills, but any electrical work must be checked by a qualified electrician. By using three separate fully articulated LED lamps it was possible to direct sufficient light through the narrow opening of the bowl and the gaps in the wood to satisfy the plant’s needs. The cabinet was also a home build made entirely from MDF (medium density fibreboard) and the door was suspended on magnets alone, negating the need for fitting hinges. This approach, if planned well, will save money and needn’t cost you anything in aesthetic value either. 1. Microsorum pteropus 'dwarf' was tied at the back of the wood with a length of fine fishing line. I was careful not to damage the leaves of the plant during tying. 2. Anubias nana 'petite' was added. There was no need to tie this plant as its roots could be threaded through the gaps in the wood. Vesicularia dubyana 'Christmas' was tied in four places. Single strands were used to create highlights in the foreground. 3. A small patch of Taxiphyllum sp. 'Spikey' was tied at the bend of a main branch. Try to tie moss in a thin layer to ensure healthy growth. The final plant species was Vesicularia ferriei ‘weeping’. A large patch was tied at the back with a few strands at the water surface. The planted wood was placed toward the back, in a 3cm layer of inert sand. The bowl was slowly filled until about 1” from the top, then three small moss-covered rocks were placed at the base of the wood using long tweezers. The lack of filter means the aquarist has to do a lot of extra work — the lack of fauna doesn’t mean you can skimp on water changes. In my previous filterless set-ups of this size — and smaller — it’s been necessary to do daily water changes of at least 90%. These must be done before the lights come on and preferably before the CO2 is started. Dosing of fertilisers can take place once the tank is filled. Daily maintenance may require some custom tools. Due to the small opening of the bowl and complexity of the wood it wasn’t possible to get a hand in there. I used a 30cm/12” section of rigid airline tube with a filter brush pushed into one end and a toothbrush head on the other. A pair of long tweezers and 25cm/10” scissors with a double bend in them are used for pruning. Clean glass and wood with toothbrush end of tool. Twist up any thread or hair algae with filter brush end of tool. Remove dead/damaged leaves with sharp scissors. Clear any remaining visible waste using tweezers and brushes. Syphon water down to substrate level. Refill bowl slowly by syphoning prepared room temperature water via airline hose. Turn off CO2 and lights six hours later. When working on small filterless tanks use plants that have already been growing submerged rather than new ones in their terrestrial state. This ensures a faster grow-in period and fewer algae issues. We can only estimate plant feeding as we cannot test for all the varying nutrients in aquaria. However we can use a formula to calculate the amount needed by basing our levels according to an experiment conducted by Estimative Index (EI) inventor Tom Barr. His experiment, and the dosage rates he ascertained from it, can be scaled up or down to suit any size tank. That’s the 'Estimative' part of the EI process. An index is a point of reference we use to guide us in determining the amount of nutrition needed to reproduce his results. Tom used a set of conditions and plants to test a new formula for growth. His results, for 'maximum growth conditions,' are now used to determine the amount of each macro and micro fertiliser needed for the best results to boost plants. That’s where the 'index' comes in. We call the technique the Estimative Index because we only work from this position as a starting point. This is the ratio of nutrients we would use as standard, but because all tanks are different, any variations will affect the results and are not set in stone. Typical EI values, as standard, are: nitrate (NO3) 20ppm (parts per million) per week; potassium (K) 30ppm per week; phosphate (PO4) 3ppm per week; magnesium (Mg) 10ppm per week and iron (Fe) 0.5ppm per week. What do I need to start EI feeding plants? To start EI, there are three essential parts: macro-nutrients, micro-nutrients and dosing equipment. Macro-nutrients are potassium nitrate, potassium phosphate and magnesium sulphate. Micro-nutrients comprise chelated trace elements, made up of copper (Cu), iron (Fe), manganese (Mn), molybdenum (Mo) and zinc (Zn). Chelation is a way of keeping the micro-nutrients in solution and available to the plants that need them, instead of combining with other chemicals in the tank and becoming unavailable. The dosing equipment would comprise bottles, measuring spoons and syringes. Is it good for all tanks, or is EI unsuitable for some? EI dosing is best suited for a high-tech, high energy aquaria with CO2 injection, strong lighting and good flow from the filter. Plants given a source of CO2 require more nutrition than tanks that don’t have one and this is where EI comes into its own. We can add as much as the plants need and it’s easy to increase dosage as plant mass increases with growth. EI dosing in a low-tech moss tank, for example with no CO2 and low lighting levels, is still possible with non-CO2 tanks in general, but the amounts added are a fraction of what’s required by gas-injected tanks. However, other all-in-one plant fertilisers that offer low dosage of nutrients would be better in this kind of situation. Is CO2 essential when using EI? It’s hugely beneficial that EI dosing is used when using CO2 at a stable 30ppm through the photoperiod. As stated, gas-fed plants consume greater nutrition than non-gas injected plants and, without a supplementary food source, plants can soon starve. However, if you do not have pressurised CO2 then liquid carbon, such as Easycarbo, can be used instead, but the level of EI dosing, not the level of concentration, should be cut by 50%. Are there any risks to fish from using it? No studies reveal any long-term effects. Many in the aquascaping community use this method, and, to my knowledge, none have reported EI-related livestock deaths. As EI aims for nitrate levels of between 20-30ppm and phosphate of 1-2ppm, there’s very little risk to your fish. Can EI foods promote algae? This is a misconception. Poor application of CO2 is the prime culprit, followed closely by insufficient amount of nutrients, rather than a surplus. Poor plant health promotes algae and lack of nutrition promotes poor plant health. It’s an easily fixed vicious circle. Is EI feeding complete for all plants, or might some need anything else? Plants need clean water, free of the organic wastes they produce as a direct result of their increased growth rates. If using RO water you need a carbonate source added too, enough to maintain a KH of at least 2-4°‚ KH, and enough calcium and magnesium to have a GH of at least 3-4° DH. EI itself does not contain these elements but they are easily replaced in RO with re-mineral powders. Can I dose macro and micro mixes on the same day? No, the iron (Fe) in the chelated trace and the phosphate in potassium phosphate (KH2PO4) tend to react with each other, especially at higher pH levels. This can render these ingredients unavailable to the plants as they combine to form iron phosphate. Why do I need to perform a weekly 50% water change? As a plant’s growth rate increases it also produces more organic waste and a large water change will help remove and dilute the most of it. In turn, this will also reduce the risk of any algae blooms forming. Can I dry dose the EI fertiliser? Absolutely — and if you have a very large tank, directly dosing teaspoons of dry salts daily can be easier than making a solution. There are plenty of calculators available online to help you fine tune the amounts and most shops selling EI fertilisers can also help in this respect. I already have nitrates and phosphates in my water, so can I still dose EI? Yes, because of the need for nutrient levels to be non-limiting it doesn’t matter what the initial levels of nutrients might be. We know that by adding the correct level of EI nutrients we will have enough for our needs and it doesn’t matter if we have an excess. I use UV and carbon in my filter, so can I still dose EI? There’s no evidence that either UV or carbon will interfere with the fertiliser. Even if they take some out of the water column, we are dosing to an excess, so there should be no issues. When making EI, should my teaspoons be heaped or level? It doesn’t make that much difference, as long as you fill to the same measurement each time you make them up. How does EI compare to traditional liquid foods for ongoing costs and how much EI will one kit produce? Using EI salts is very cost effective. A 500ml bottle of EI fertiliser, once made up, costs around £1.20. Compared to more than £10 for a 500ml bottle of a pre-made liquid fertiliser, yearly savings are enormous. Our own kit provides enough dry salt to make up some 16 bottles before replacements are needed. Some parts of the kit last longer than others. Magnesium sulphate will make 16 500ml bottles where there are enough chelated trace elements to make 45 500ml bottles over the same period. In many cases, one kit will easily last one year. 1. Measure out four teaspoons of potassium nitrate, one teaspoon of potassium phosphate, and six teaspoons of magnesium sulphate. Add these to your 'macro' dosing bottle, avoiding spillage. If you have a funnel it will prove useful with this task. 2. Add 500ml of water to the bottle and using it boiled and cooled will kill any bacteria, avoiding mould blooms. However, don’t be tempted to use freshly boiled or still hot water as this will adversely affect the results. 3. Shake well and leave overnight to make sure all the salts have fully dissolved. You may need to shake the bottle a couple of times over this period to avoid settlement. 4. Measure out one teaspoon of chelated trace elements and add these to a separate ‘micro’ dosing bottle. Do not mix the macro and micro-nutrients in the same bottle. 5. Add 500ml of water to the bottle, using it boiled and cooled. It’s worth marking the two bottles at this point so that you know which is which. 6. Shake well and leave overnight to make sure all the salts have fully dissolved. Note that the trace elements are slightly discolouring in the bottle. This is normal. Offer the macronutrients three times a week at a rate of 10ml per 50l/11 gal of aquarium water. Dose the micronutrients three times a week — also at 10ml per 50l/11 gal of aquarium water. Don’t dose the different bottles on the same day, as this can lead to some ingredients locking up. Offer micro one day and macro the next. Perform a 50% water change on the tank each week during the dosing. George Farmer decides to set up a nature aquarium against a self-imposed deadline and in such a shallow tank that much of the dÃ©cor is exposed to fresh air. I couldn’t refuse the opportunity to grab a bargain-priced ADA 45-F aquarium and I set myself the challenge of growing in a nature aquarium style of aquascape using mostly slow-growing plants. 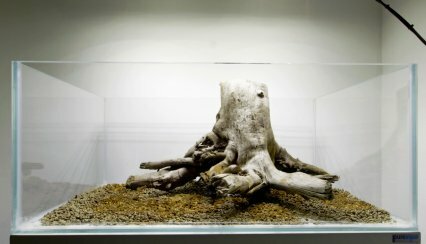 The tank is only 16cm/6.3” tall, so having the wood and plant life exposed to air is almost a necessity to fulfill this aquarium’s creative potential. The ADA 45-F is just 45cm/17.7” long, so fine plant textures are essential to maintain an appropriate sense of scale. I just love crypts and Tropica’s two smallest species, Cryptocoryne parva and C. x ‘willisii’, would make ideal foreground and midground plants. A new tiny Eleocharis species would fill the open right-hand space perfectly. Bolbitis and Anubias nana ‘Petite’ attached to the wood all add up to make the focal point, positioned approximately in accordance with the golden positioning ratio or the rule of thirds. Because there were so many fine wood branches intersecting and crossing over one another, attaching plants was simple. All I needed to do was gently insert the plant roots and rhizomes between the small branches and that would be enough to secure. Juncus repens is an interesting plant that’s rarely seen in UK aquascaping. However, it was perfect for this aquascape as the flower spikes already present could be allowed to grow on further above the waterline. To be able to grow the plants as quickly as possible, before a deadline I had set myself, I had to resort to some unorthodox growing methods. Lighting was intense with four 24w HO T5 suspended as close as I dare to the aquarium. I didn’t get a chance to measure the PAR, but it must have exceeded 250µmol at the substrate, especially with the water level being so shallow. With this crazy lighting it’s essential to inject sufficient CO2 and other nutrients to ensure the plants are amply fed. Too much light with not enough CO2 is a surefire path to the dreaded algae monster! The gas was injected at an incredible rate using an external inline diffuser. The water was flooded with CO2 mist, giving all the plants access to massive amounts of the gas. I dosed three millilitres of Tropica Plant Nutrition+ and three millilitres of EasyLife EasyCarbo every day just after a 90% water change. This would ensure plenty of micro and macronutrients being available at all times and the large daily water change would help prevent algae. I kept this regime up for just seven days before I had to attend a two-week course away from home. There was no way I could rely on my family to perform the daily maintenance tasks in my absence, so decided to change to a much lower-energy system. I halved the lighting to two T5s and suspended the unit 80cm/31” above the water. CO2 had coincidentally ran out and it was not worth me replacing the 2kg cylinder in view of my impending departure so I put my trust in the EasyCarbo. One millilitre of Tropica fertiliser and the same amount of liquid carbon fertiliser were added daily. I returned from the course and the growth was impressive! There was no algae and lots of new growth, especially with the new hairgrass that is reportedly a slow grower. Special thanks to my eldest daughter for dosing the tank and topping up evaporation losses in my absence! Rather than go to the expense of having a cabinet custom-built to fit, I used my existing gloss white cabinet that previously supported a 60cm/2’ shallow aquarium as featured in PFK, June 2012. The cabinet’s footprint exceeded the size of the ADA 45-F, but this could be used to my advantage. The aquarium sits on the cabinet with an overlap of around 8cm/3.1”. This allowed enough space for a hole to be drilled to allow through the filter hoses and glassware. The 60cm/24” luminaire did not look too out of place either, being flush with the cabinet. In the long term I would definitely consider building the luminaire as a dedicated fixture that would allow the power cables to be hidden while suspending the unit. I used a 12mm gUSH nano glassware filter inlet and outlet. Because the tank is so shallow I had to raise the inlet to stop the bottom from interfering with the substrate. I would certainly like to see a manufacturer decide to produce glass filter inlets for very shallow aquariums! Having a maximum volume of less than 17 l/3.7 gal, this aquarium is very limiting as regards fish choice. Half a dozen Microdevario kubotai were supplied by The Waterzoo, Peterborough, and a dozen yellow variety of Cherry shrimp were sent by freshwatershrimp.co.uk. These were added after the CO2 injection had stopped, for there’s no way any fish or shrimp could survive the huge levels of gas I injected in that initial week! 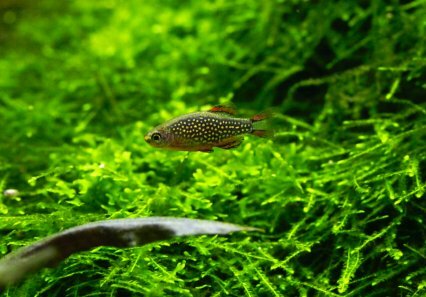 M. kubotai make brilliant nano fish and their subtle colouration provides a pleasant blend with the green planting and the yellow shrimp offer a refreshing change to the usual bright red Cherry we often see. 1. The cabinet is drilled to create an access point for pipes and hosing. 2. A mixture of both brown and black TMC NutraSoil is added to the base. 3. A single piece of Sumatran driftwood is added a third of the way along. 4. Anubias and Bolbitis plants are added directly to the wood. 5. Juncus and Cryptocoryne species are added at the 'dense' end of the 'scape. 6. Small amounts of Rotala are added for density and bushing within the layout. 7. The quieter end of the tank is filled out with Crypts and Hairgrass. 8. The tank is filled and any final planting adjustments made. 9. The completed tank, shown here 14 days after planting. If you're a fan of shallow aquariums or just looking for some inspiration, check out George's other shallow tank aquascape. How to create a multi-tank set-up - with plastic plants! Dean Barratt's trio of plastic greeneries complement each other perfectly. Nathan Hill marvels at the results. I’ve seen Dean Barratt work on two set-ups before and both featured in previous issues of PFK. His first was an aquascape using nothing but plastic plants in a Juwel Rio 240. It left me gobsmacked. The second was an audacious paludarium: half water, half land and a repeat run of plastic plants. It looked fantastic. This latest project was the result of a conversation between Dean and PFK editor Jeremy Gay. This time around we wanted to see what he could deliver if we asked for him to create the triptych — that rarely seen but strikingly effective three-tank layout, when done right! The end result is a fascinating talking piece and one which can lend itself to a wide variety of fishes — and all at a cost comparable to a single, larger aquarium of similar volume to these three combined! The wonderful thing about a set-up like this was the time taken to put it together. Dean had to work at short notice to get things together in time for the PFK visit. In the event he worked over a single afternoon and late into that evening to create what we see here. Instant greenery, instant appeal, no tiresome waiting for plants to grow in to see if they work in the layout, and, most of all, no laborious regimes of feeding, gas dosing and trimming. It goes without saying that Dean’s aim was to produce a visually captivating trio, but there’s far more to it than that. He wanted to present three tanks that not only worked as a collective, but also as a trichotomy, with each tank a display in its own right. Even more, Dean aspired to make tanks that worked as respective pairs, with the left and centre tank forming a display that could be viewed as very different from the right and centre coupling. Initially the aim was to produce a ‘Z’ shape of hardscape, starting high in the corner of the left-hand tank, trailing through the centre line of the middle one, before turning back on itself in the right hand display and creeping back into the centre again. Confused? It makes no odds, as Dean experimented with the idea but never ran with it! Dean’s first hardscape layouts involved this long sweep, using a combination of Mopani wood and pieces of acquired Seiryu stone. However, as good as this would have looked with an Iwagumi, low-laying approach to planting, Dean had more intense efforts in mind and found there was too much hardscape to work around. Eventually, his design led to just four pieces of Mopani spread over the three tanks, with only a light placement of the stone. This he felt worked much better — not competing with the planned plants, and, in the event, he found that much of the hardscape was lost behind the synthetic growth. Dean wanted to use wood as Amano does, where the ochre tones are complemented by green hues of plants and vice versa. The eureka moment finally came when he was playing with the tall grasses and water ferns in the left hand tank (pictured above) and central tank (below). These rapidly became Dean’s focal point and a starting platform from which to layer all the rest of the layout. Dean’s biggest issue was with the bulk and boldness of his own plants and the reason why any kind of Iwagumi attempt was rejected. Here, the boisterous shapes of the wood work well with the brazen effect of the fake plants. A loud and punchy tank was by far the safest option. We noticed how Dean was prepared to cut his plastic plants into smaller portions, so freeing him up with just what he could fill in and where. Rather than being restricted to ‘growth’ from the bases, he opened up a new dimension in plugging gaps and adding sprigs of shape and colour — a technique we’re now eager to try out ourselves. What fish would suit this set-up? This set-up was put together long before any cycling could have taken place, so the tank had no fish when we visited. However, Dean considers White Cloud Mountain minnows a good option as they will not clash with the planting levels. Whatever fish we’d opt for it would have to be able to tolerate unheated tanks, as these three were set up in the absence of any heaters. Space is an obvious consideration, as each of these 35 l/7.7 gal tanks can hardly be thought of as huge. As for this author’s input, I’d slip discrete heaters in the tanks anyway and get some Galaxy rasbora swimming among those colours. Stunning! 1. Unipac Silica sand is added; 8kg in the left tank and 6kg in each of the others. It will all be partly displaced by plant bases. 2. Dean adds the core aquascape of four small Mopani woods, as well as a central slug of Seiryu rock. Much will be hidden. 3. The bulkiest of the background plants are added and the initial sloping shape starts to form. Note the plants breaking the surface. 4. 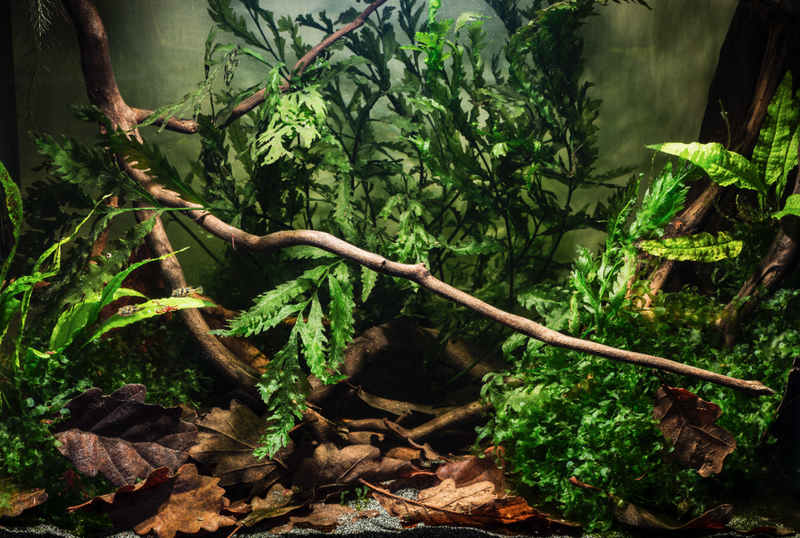 The central and lower feature plants are added, dominating the wood in the first tank. We now see a definite slope taking shape. 5. Shaped, lower background plants are placed to bring centre and right hand tanks together, and make an unbroken visual curve. 6. Foreground plants are now added, smoothing the contrast of some exposed hardscape. Note the use of various shades to best effect. 7. The hardware is rigged up to the Eheim tanks and now all three are lit to show exactly what the final illuminated effect will be. 8. After some final tweaking the water is eventually added, alongside pieces of Seiryu stone originally omitted from the design. How does your plastic garden grow? Tanks like these have an immediate advantage over living, breathing counterparts — they don’t need food! Some can argue that with real plants, pollutants, such as nitrate, are kept much more in check, although with light stocking levels these tanks could safely manage — and, with regular water changes, these displays could be kept looking fresh. Dean says for tanks like these he’d run a 35-40% water change every three weeks or so. Given that those plants don’t need light to grow, another problem can be avoided — and that’s algae growth. There’d be no problem keeping these three in some ambient illumination until you got home from work, and then had the lights running for your viewing pleasure during the evening. Of course, less light means reduced algae, which, in turn, can mean much less work! The plants will need a clean maybe every four months and, for all three tanks, Dean estimates it will take around two hours for everything to be completely scrubbed. Of course, specks of more stubborn algae will start to build up here and there, and you’d probably want to think of changing the worst affected ones every four or five years for fresher versions. It may seem like an expensive way to get an instant result but, as Dean points out, an initial outlay on live plants can also be high, and once CO2 and fertilisers — not to mention expensive substrates — are factored in, he insists it can be a much cheaper way to have a tank with not only instant appeal but staying power. Eheim for making the project possible. The Eheim tanks and cabinets were supplied by J and K Aquatics. Thanks also to Unipac for the Congo sand. George Farmer liked the look of a new and trendy shape of aquarium so much that he had one custom built â€” and then created one of his favourite aquascapes. Aquariums have been traditionally made with their height exceeding front to rear depth, so that the frontal view is the largest, most dominant aspect. However, there’s a new trend developing whereby the aquarium is made open-topped with no braces and deliberately shallow. The best have a greater front to rear depth that offers more space for aquascaping. A good example is an aquarium measuring just 25cm/10” high but 40cm/16” in width and 60cm/25” in length. This is the size used for this feature and, so far, the best-sized aquarium I’ve yet owned. A shallow aquarium offers new areas for creativity. Decorative materials such as wood, rocks and plants can be deliberately exposed above the water to add a world of new dimensions. Many aquarium plants are happy to grow above water and some also produce attractive flowers. If the aquarium is in a relatively low position the aquascape can be easily viewed from above, giving it a more natural pond/pool-like appearance. Shallow aquariums are also easy to maintain. Using longer aquascaping tweezers and scissors I can perform simple pruning tasks without getting my hands wet! Because a shallow aquarium has a greater front to rear width it creates a larger surface area to promote oxygen. However, the dimensions of such an aquarium render it unsuitable for deep-bodied fish. Water evaporation is quicker because of that large surface area and it increases with more surface agitation and higher water temperatures. It’s best to top up losses with reverse osmosis filtered water, as this prevents mineral build-up in the aquarium. The main pictures here of the aquascape were taken when it was about four months old. The design is based around the large piece of wood representing a tree trunk as the focal point positioned off-centre to give aesthetic balance. I have chosen lots of different plants species and mixed them up to create a wild look. Hygrophila sp. ‘Araguaia’ is relatively new to the hobby and stays relatively short, making it an ideal candidate for the background. It changes colour, depending on lighting and nutrient levels, ranging from a green/brown to a crimson red. Brown crypts planted around the trunk make for an ideal transition from the carpeting plants and the colour harmonises so well with the bright green. After a couple of months the moss really takes hold on the wood and requires regular trimming. It also creeps above the surface and grows well in its emerged form. The remaining areas are planted with a mix of foreground species, ranging from the very fast growing Glossostigma and Hydrocotyle to slow growing Lilaeopsis brasiliensis. At first planting is quite regimented but, as the plants merge into one another, a more naturalistic appearance takes hold. Every few weeks the entire carpet can be hacked back quite brutally with large scissors, and healthy new growth soon occurs — seemingly better with each pruning session. This is testament to the high quality substrate and fertiliser system, as well as ideal CO2 levels and distribution. Fish selection was relatively easy. I have always wanted to try Celestial pearl danio (Danio margaritatus) but never realised how shy they were. I had to sit almost motionless before they would show, unless being fed. I added a shoal of Danio choprai that made the D. margaritatus more confident and the interaction between the two species proved quite fascinating. This is an essential component for any planted aquarium. I’ve used LEDs in long-term set-ups and had no trouble growing any plants. I used TMC 1000ND tiles for most of this aquascape’s life, but recently experimented with T5 lamps. I still love T5 because the colour rendition is incredible, depending on the chosen lamps. I have been using Arcadia Plant Pro and Arcadia Freshwater Pro in combination, which produces a well-rounded colour rendition as well as great plant growth. I have also tried the impressive EcoTech Radion XR30w (pictured above) which can create almost any colour, thanks to its programmable red, green, blue, cool white, blue and royal blue LEDs. In the images shown here I have used 100% red, 100% green, 20% blue, 100% cool white and 0% royal blue. The Radion has certainly earned its niche in the freshwater aquascaping hobby. It’s ideal for those who like to change their aquascape frequently and change lighting to suit. As a tip, buy or borrow a PAR meter to measure your current lighting levels. If it’s over 50 µmol at the substrate you’ll need CO2 injection and regular fertiliser additions. If you have suspended lighting raise or lower the unit to adjust the intensity. Lighting over 100 µmol at the substrate will demand high CO2 and nutrient levels and is only recommended for experienced plant growers. High-output T5 lamps with electronic starters will remain operational at near full strength for their entire life — and that can run into several years. T8 lamps with electromagnet starters will degrade gradually and need replacing every 12 months or so. My daily routine means spending just five minutes tinkering here and there. The fertilisers are dosed, then any plants needing pruning are nipped back with long scissors. Floating cuttings are netted off and either re-planted or composted. One of the trickiest plants to maintain is the moss. It sinks as soon as it’s pruned, so try and remove as much as possible before it starts to settle among the carpeting plants. Water changes are incredibly easy too. A 50% change using de-chlorinated tap water takes around 15 minutes. Monthly: Clean glass filter inlet and outlet and filter hoses. Always clean the aquarium glass just before a water change. This way the algae removed from the glass is also removed via the water change. Don’t be afraid to prune your plants, but use sharp scissors. In a healthy set-up this promotes new growth and the old cuttings can be re-planted, given away or sold. Always dispose of unwanted plants responsibly. 1. The Optiwhite glass aquarium was custom built to fit an existing cabinet. The low-iron glass has greater clarity than regular float glass. The aquarium is braceless, so ideal for suspended lighting and glass filter lily pipes. This style is perfect for aquascaping enthusiasts. 2. A piece of Unipac Sumatra Wood resembling a tree stump is added. It has been pre-soaked for three weeks to prevent floating or staining. I have positioned it off-centre to provide aesthetic balance. The roots at the bottom ensure the stump looks natural. 3. Five litres of Elos Bottom Mineral are then added. This product is enriched with micro and macro nutrients and has a high cation exchange capacity (CEC) that takes in nutrients from the water and makes them readily available to the plant roots. 4. More nutrients and bacterial cultures are then added to the ‘scape via Elos Terra Zero and Aqua Uno. The substrate is cleaned from the aquarium sides so when the soil is added it does not show through the front or sides of the glass. 5. Nine litres of Elos Terra Black Medium are added. This is a soil-based substrate that lowers the pH and hardness. It does not produce ammonia, like some soil products. The grains are light and tiny at 1-4mm, so they are just perfect for root penetration. 6. Some water is then added to the aquarium. I add to around 25% full to make planting easier. Planting into wet substrate is possible, but I find plants tend to stay supported better if planting is done under a little water, especially in loose soils. 7. Cryptocoryne wendtii ‘brown’ is added around the wood. This tolerates shade and is slow growing, making it ideal for long-term aquascapes. The colour looks natural next to the wood. There will be crypt melt as the plant adjusts to new water conditions, but it will revive. 8. Staurogyne repens is added to the remaining open substrate in the background. Staurogyne is attractive, doing best in a nutrient-rich substrate with CO2 injection. It takes time to establish but is robust once settled. Frequent pruning produces offshoots that help it spread across the substrate. 9. Hygrophila sp. ‘Araguaia’ is added to the background. It has a lovely texture and colour and does not grow tall. In good light it will turn an attractive reddish. It is also quite slow growing, compared with other Hygrophila species, so ideal for a lower maintenance set-up. 10. The water is topped up as required. Nymphaea micrantha was added but subsequently removed as it did not suit the layout. During following weeks more species are added, including Glossostigma elatinoides, Eleocharis acicularis, Lilaeopsis brasiliensis, Riccardia chamedryfolia, Vesicularia montagnei and Hydrocotyle sp. ‘Japan’. 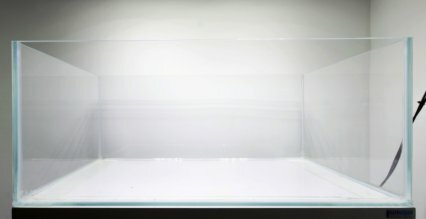 Aquarium: Custom Optiwhite glass, 60 x 40 x 25cm (25 x 16 x 10”), 60 l/ 13 gal. Cabinet: Pureaqua gloss white cabinet from Aquajardin. Lighting: Two TMC 1000ND LED tiles and computer controllers, 30w each, suspended 30cm/12” above aquarium, eight-hour photoperiod. Filter: Fluval G3 with Hydor ETH200 external heater and gUSH glass inlet and outlet. CO2: Dennerle 2kg pressurised system with solenoid and Up Aqua inline diffuser. Substrate: Elos substrate system, 9 l/2 gal Terra Black with all Elos additives. Fertilisers: Elos Expert-Line fertiliser system. Fish/inverts: Danio margaritatus, Danio chropei, Neocaridina heteropoda ‘red’, Neocaridina heteropoda ‘Rili’. Plants: Hygrophila sp. ‘Araguaia’, Glossostigma elationoides, Eleocharis acicularis, Lilaeopsis brasiliensis, Hydrocotyle sp. ‘Japan’, Crypocoryne wendtii ‘Brown’, Staurogyne repens, Taxiphyllum barberei ‘Mini’, Riccardia chamedryfolia. If at first you fail, be brave and start again. Nathan Hill chronicles a reader tank revamp that needed a year and a fresh approach to finally succeed. When I penned the idea for a reader tank makeover, I had no idea how long the ride would be. The project was to ultimately spread over more than a year! The initial plan was straightforward enough. All I wanted was a regular reader’s aquarium in need of an overhaul. I sent out feelers, threads on forums, posts on Facebook — and soon I found just the right tank! Eleanor Woolley’s Juwel Trigon 350 was a valiant effort, but looked as if it had lost its way. The fish were in good health, but the layout — silver sand and scattered, alternating hardscape and plants — indicated it had reached a dead end. It wasn’t a shed of a tank with dying livestock and the kind of glass you find in 500-year-old shipwrecks, but at the same time it wasn’t a near immaculate aquascape with a reader just trying to get hold of some freebies. Now all we needed was to knock heads and get it made over! I’d wanted to get a real aquascaper’s slant, so asked PFK contributor George Farmer. He took the initial plans for the layout entirely under his wing, communicating with Eleanor about what she would want from her display and planning the best way to go about it. Eleanor has a thing for angelfish and tetras and, given the South American feel of the aquarium, it was decided to go for an Amazonian effect. To that end we recruited Joey Abrahams of Aquadip to help with the most appropriate plants. Where possible, George wanted lower maintenance and Eleanor concurred. It was soon decided that a mix of Echinodorus swords, along with some Sagittaria would be the way forward. These plants, although requiring care with nutrient and light, are straightforward varieties and capable of dealing with a little rough handling and abuse. Then it was time to reassess the hardware. Juwel systems are great all-round tanks, but often require tweaks and additions if working as dedicated planted systems. The hardware on Eleanor’s aquarium was dated, so we decided to revamp the lighting, up the filtration, and stick on some CO2, so made some calls and soon received a bounty of goodies. George wanted something with oomph to light the tank so we went for a combination of Fluval’s Power Glo and Life Glo fluorescent tubes. This would give a suitable spectrum for the plants but, with the refreshing, crisp light of the Life Glo, we knew we’d really bring out the colours on the fish. We also all felt that flow and filtration could be reappraised, so pulled some strings and arranged for JBL to send a CristalProfi e1501 canister filter. CO2 was also taken care of by JBL which came up trumps with one of its M602 sets, with a solenoid controller that we could run into a simple plug-in timer. Finally, armed with a mix of JBL Manado substrate, as well as TMC’s Nutrisoil, we got a box of mixed Sagittaria and swords and made our way to Eleanor’s home in Chesterfield, Derbyshire. In late 2011 our first consideration was available space. The room housing the aquarium isn’t massive and is patrolled by inquisitive felines, so I couldn’t spread any gear and plants around the floor. The first job was to strip down the existing set-up and, to make life easier, I had brought a smaller Fluval aquarium to temporarily house some of the fish. The thick bed of silver sand was hauled out, along with existing décor and planting. Although there were some nice original bits in the tank, George had set his heart on not mixing and matching any different wood types and had brought a combination of Sumatran wood pieces with petrified wood for hardscape. The 50/50 mix of Nutrisoil and Manado substrates went down in a good 6cm/2.4” layer. A central pile would be the way forward, with plants on the peripheries. Nobody was spared the task of preparing plants, unpotting them, clipping roots and trimming back straggly leaves. With George wrapped up in his aesthetic designs, Eleanor and I set to task rigging up filters, CO2 and changing the lighting. The old tubes had long passed expiry dates and when we ran a PAR meter under them in the aquarium got levels as low as three and four. We did our best to conceal pipework and CO2 towers toward the rear, with planting helping to obscure equipment. The only hindrance was a rather ingenious cover devised by a relative of Eleanor — in part to support cat weight on the lid, as well as retaining heating. Working around this, we eventually had things fitted. Several hours later, having refilled the tank with colanders and hoses, and having reintroduced fish to the already established filters, we thought we were done. We just needed to return in a week or two to take photographs. Everything started to crumble in the following period (see picture above), mainly due to my miscalculations over the time I had available. The initial outlay did not want to take hold, despite Eleanor’s efforts. Algal spots started to appear on leaves, Amazon swords started to wither and fade, and neither George nor myself could secure time from our Peterborough base to Chesterfield to help her. We tried a range of ‘quick fixes’. We dosed algaecides and liquid carbon, we altered lighting and CO2. We suggested water changes, but nothing seemed to slow the decline of the whole set-up. Things went from bad to worse when RAF serviceman George was called to Afghanistan. Eleanor and I then realised we were on our own! Eventually an opportunity presented itself and I returned to Chesterfield. Aquadip again donated a box of mixed Amazon swords and Eleanor secured loads of CO2 from a dedicated gas supplier. The basis of my emails with Eleanor had left me imagining a worst-case scenario. In the event, most of the swords had gone and the remaining Sagittaria was bogged down with algae. A lot of the hard slog had been carried out by George a year previously, so I had no need to change substrates, no need to plumb in hardware and the hardscape only wanted the slightest tweak. I did need a look at the lighting, however. A year of shining had taken its toll and things were starting to look tired again. The first thing to do, though, was to address the plants and everything came out. All the greenery went and the instructions were clear: if it doesn’t look great and the algae won’t come off, chop it off. If you need to chop it so nothing remains, bin it. Much was binned, but what remained was showing potential. Even the photographer got stuck in, hand scraping any algae that would loosen freely. We soon had a bucket of written-off greenery — but also healthy shoots. The Aquadip plants were unpotted, roots trimmed, rogue leaves removed. This time we were going for a simple yet dense layout. I re-jigged the hardscape and we started planting up the classic way; short plants in the front, working to the largest at the back. We’d set our hearts on something more chaotic and natural than buff and aquascapey, so a little disorder was appreciable. After all, we just wanted the fish to look and behave naturally. Without excess aesthetic planning, planting was done in record time, the Nutrisoil/Manado base taking to the roots and pinning them down in spectacular fashion. After a quick refill, dechlorination and topping up of water we’d removed to make life more bearable, we were ready for more fish and new lighting. A jaunt around a couple of local stores produced the lighting needed — a brace of Interpet’s Tropical and Colour enhancing high-output T5s. Eleanor wanted to continue with the South American Community theme, and so we hunted fish to suit. She already had some stunning Pterophyllum leopoldi, along with a single scalare missing a ventral fin and given a nickname I couldn’t publish here for legal reasons! Also in the aquarium were Black neon tetra, very adult Emperor tetra, and a handful of Otocinclus. Less obvious, but also making the occasional appearance was a single Gold Nugget plec. Eleanor was sold on some Flame tetra to complement the darker hues of the existing fish, so we picked some. We also wanted to shore up numbers of Otocinclus to help keep on top of algae growth on leaves. To add vibrancy to the base, we wanted to add some Corydoras species. It wasn’t long before a few plump C. sterbai waddled in to view and it was a done deal. Having had success with Estimative Index many times and having it seen put to such good use elsewhere, I called on the guys at Aquarium Plant Food UK to despatch a kit — which they did, along with a new glass drop checker to ensure correct dosing of the CO2 Eleanor would be using. Almost a year on, the tank is full of plants, fish, CO2 is bubbling, plant food ready for daily dosing and all of it under fresh lighting! We love to get inside the minds of other fishkeepers, so it stands to reason I’m not letting a chance like this pass! "When I was younger, I had surgery on my spine for a curvature, it involved my back being broken and having to heal. I had to rapidly learn to walk again - the "big" goal was to walk to the end of the ward so I could see the fish tank. Then I could go home. You have no idea how much I wanted to finally see that fish tank. Call it utter mush, but aquariums bring a real sensation of freedom and happiness for me." Asked how long she’s been keeping fish for, she tells me: "About six years. I was desperate to have an aquarium, so going to uni was my opportunity to do it uninterrupted. I went out and got a good old Clearseal 45cm/18”, a tiny heater and a Stingray filter so I could keep White Clouds." Given the latest project here, it’s safe to say that Eleanor is definitely geared as a more serious aquarist. When we first started the makeover the tank had very different inhabitants - three angelfish, a Kribensis and a handful of mollies. A high-energy planted tank has lots of everything — lights, CO2, nutrients, lots of circulation and high maintenance demands — and I set up this one six months prior to this feature. It’s seen a few plant additions and removals, but is basically the same, based around Manzanita wood which requires soaking for a day or so to ensure it sinks, but it rarely leaches tannins. Lit with suspended LED tiles and filtered with the latest generation external it’s not the cheapest set-up, but the ease of maintenance these products provide go some way towards keeping a healthy long-term planted tank. The filter has a mechanical pre-filter that takes seconds to clean. The CO2 system consists of a 2kg gas fire extinguisher, regulator with solenoid and an external inline diffuser. Fitted to the external filter outlet hose, CO2 micro-bubbles get blasted around really effectively, ideally reaching all parts of the tank. The quartz gravel is easy to clean when re-planting too. A daily dose of quality liquid fertiliser mean the plants don’t go hungry and the tiles produce more than enough light to grow any plant here. I added Sagittaria subulata to complement the Giant hairgrass (Eleocharis montevedensis) in the background. The former is now one of the fastest growing plants I’ve seen and I’m removing more than a dozen leaves every day. Another prolific grower was the Dwarf hairgrass (Eleocharis parvula) in the foreground. Maintenance was a weekly chore, due to the lengthy process of netting off floating cuttings. Eventually I removed the lawn of hairgrass you can see in the main picture and replaced it with plain river pebbles as show below. Slower growers included the Microsorum pteropus ‘needle’ and Cryptocoryne wendtii 'brown', dwarf Alternenthera and Potamogeton gayi. The latter (shown above) became a haven for hair algae, as did some Java fern leaves. At the same time I saw cyanobacteria forming among the hairgrass, but a three-day blackout resulted in a sparkling algae-free tank. Biggest successes have been the Vesicularia montagnei and Riccardia chamedryfolia. Regular pruning has been the key. The substrate in a healthy planted tank should not require vacuuming, as plants use waste matter as nutrients – but don’t overstock with fish and employ decent mechanical and biological filtration combined with effective circulation. Wave your hand near the substrate to stir up loose detritus and syphon the dirt-filled water as part of your water change, ensuring the replacement water does not disturb the substrate. 1. The braceless open topped Optiwhite glass tank has suspended lighting. 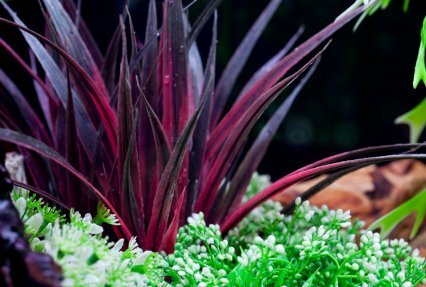 The 1cm/0.4” layer of clay-based Tropica Plant Substrate takes in nutrients from the water and gives them to the plant roots. 2. Pre-rinsed fine quartz gravel is added. The colour makes it ideal for an open foreground and contrasts with the wood. The quartz is sloped deeper at the rear to increase sense of depth. 3. The Manzanita is placed to ensure a balanced look. I’ve attached some Vesicularia montagnei and Riccardia chamedryfolia using a ‘super glue’ as it is easier to use than cotton and safe. 4. The tank is filled about halfway prior to planting. Eleocharis montevidensis is added, with Cryptocoryne wendtii 'brown' in midground and Eleocharis parvula in the foreground. 5. The remaining plants are added using tweezers. Ranunculus inundatus has an interesting leaf shape. Potamogeton gayi is seen left of background and a dwarf red Alternanthera is left of midground. 6. The tank is filled slowly and equipment fitted. An external filer is fitted with glass inlet and outlets and water heated inline, CO2 injected by external diffuser. The set-up is then fishlessly cycled. Most plants will take time to adapt to their new environment, so assuming you have good growing conditions just be patient with them. You should see new growth in a couple of weeks. Prune off any struggling leaves to allow the plant to use its energy more usefully. Daily: Check and feed the fish, check filter and add liquid fertilisers. Weekly: 50% water change, clean glass, clean pre-filter, prune any excess plant growth. Monthly: Clean glass pipes, clean pebbles, prune ferns and moss. Many fishkeepers find ferns incredibly useful. Jeremy Gay answers some of your FAQs about these tough and popular plants. Regular readers will be well aware just how many times the name Java fern crops up in each issue of PFK — and for good reason. Whether you are a plant aficionado or complete beginner, and have a nature aquarium or cichlid tank, ferns can prove incredibly useful. Two main genera of fern are available in the hobby: Microsorum and Bolbitis. The former in the main is represented by Java fern (Microsorum pteropus) and is part of a fern mega-family containing 1,000 species. Most are epiphytes, meaning that they grow on a surface like rocks or wood instead of in the soil. They are most commonly found in particularly wet environments, like rainforests, and our Java fern also grows out of the water in the wild rather than beneath it, not how we keep them. Where are these ferns from? As the name suggests, Java fern is from South-East Asia, where it is quite widespread. Bolbitis heudelotii (pictured above) has the common names of African fern or Congo water fern and comes from the wet areas of the Congo rainforest in West Africa. What water conditions do these ferns need? They are incredibly hardy, leading to widespread popularity. In nature they grow out of the water in shaded, tropical, moist conditions, though in the aquarium will grow fully submerged in soft or hard water, temperate or tropical. They are often recommended even for brackish tanks, though it’s more likely that they just take a long time to die in salty conditions, rather than actually thriving. Grow them in soft water which has reasonable water flow, a comprehensive liquid fertiliser and CO2 fertilisation. What type of lighting do ferns need? Ferns the world over are known for preferring shade and these are no different. In Singapore plant farms, Java fern and Bolbitis are actually grown under thick shading material to prevent exposure to strong light. In the aquarium both types will readily adapt to strong light, however, although they don’t need it. Anything from one T8 fluorescent tube upwards will be fine. Who will benefit most from keeping them? If you keep fish indoors in freshwater, you probably qualify as a potential for Java fern (pictured above). 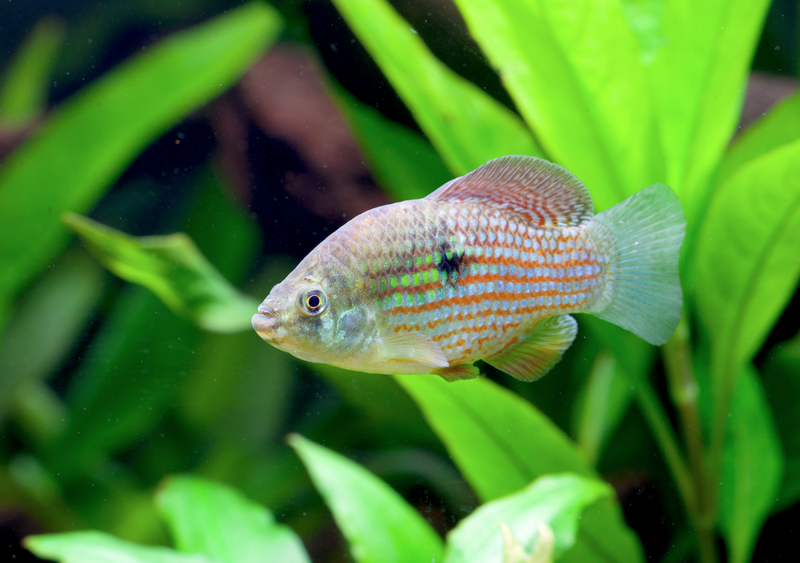 It’s used by goldfish keepers, cichlid keepers, plant growers and Discus owners, as with plant-eating fish the tough leaves are usually left as they seem largely unappealing and inedible. Where do I plant them? On average both Java fern, its variants and Bolbitis grow to around 30cm/12” high and 30cm/12” in diameter. Because of this shape they are usually placed in the midground and make eyecatching specimen plants in their own right. As they grow on rocks and wood they can contribute to some particularly interesting aquascapes, growing on protruding branches or even vertical rock walls. How do I fix them on wood? Buy a pot of any fern and choose a suitable rock or piece of wood. Rough surfaces, like that of lava rock, make for a better anchorage than smooth pebbles. Remove the fern from the pot and tease away the rockwool growing medium from the roots. Then hold it to the rock or wood while you tie it in place with loops of fishing line. Knot the line and you are done. Over the next few months the fern will attach to the surface of its own accord. It will grow over the fishing line or you can cut if off. That’s your choice. How do I fertilise them? Growing off the bottom of the aquarium, substrate fertilisers will be useless. Instead use an all-in-one liquid fertiliser daily and CO2 diffused into the water. How do I propagate them? It’s easy as you can simply prize apart or cut the plants rhizome — fleshy root — to produce several plants or, in the case of Java fern, it propagates its own daughter plants on the undersides of its leaves. These can then be pulled off when just a couple of inches long and be attached to a new surface. Ferns are slow growing when compared to stem plants like Hygrophila, so that is often reflected in their price. Expect to pay upwards of £3.50 for a basic Java fern in a 5cm/2” diameter pot and more for Bolbitis or rarer Java fern cultivars such as 'Philippine' (pictured above). Plants sold growing on wood or rocks are typically upwards of £15, depending on size and mother plants — very large specimens — may be upwards of £30. Avoid 'bunches' of Java fern as these are often just leaf cuttings tied together and missing the all-important rhizome. The original Java fern has been in the hobby for a long time and has proved highly variable. This has resulted in many cultivars of the original Microsorum pteropus, including Narrow fern, Needle fern, Trident fern and Tropica’s ‘Windelov’ (pictured above). There are then another 50 species in the genus Microsorum, though few, if any, are in the hobby. Bolbitis is also a much larger genus than you may have thought with more than 60 species, though, of those, B. heudelotii is the most popular by far with the asian B. heteroclita more rarely available. Virtually any aquatic shop or website will sell Java fern, though deal with better aquatic shops and mail order plant sellers if you want rarer varieties. New varieties are being released all the time, so expect more in the future. 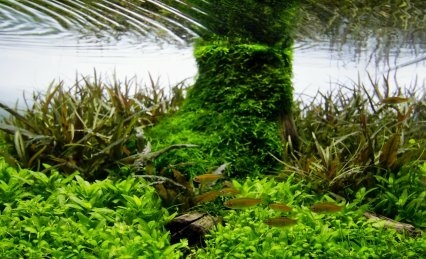 George Farmer takes a look at how to measure the levels of CO2 in the planted aquarium to ensure it benefits the plants, while remaining safe for your fish. Carbon dioxide (CO2) injection in planted aquaria has become very popular and ever more manufacturers are supplying user-friendly kits. Carbon is the most important element for plant growth and gas injection is the most effective way to provide this nutrient. However, it is not a simple case of adding as much as possible. This gas is highly toxic when overdosed and is probably the biggest cause of livestock fatalities in planted aquariums. It is therefore vital to test or monitor gas levels in the long-term. A CO2 content of 30 parts per million (ppm) or milligrams per litre (mg/l) is safe for most fish and inverts. However, the toxicity threshold can vary considerably, depending on dissolved oxygen (O2) levels. In aquariums with relatively low levels of O2, the livestock will be more sensitive to the gas, but in aquariums with high levels of O2 the safe threshold limit of CO2 increases. When CO2 gas dissolves in water it creates carbonic acid. This will acidify the water and pH will decrease. This basic relationship allows us to determine approximately how much CO2 is in the water. Another important aspect to water chemistry is carbonate hardness (KH). Also known as alkalinity, the KH represents the pH buffering capacity of the water. Harder water will have a higher buffering capacity and vice versa. The intrinsic relationship between CO2, pH and KH is known and can be found in the table above. Use it to test your pH. Let’s say it’s pH 6.6. Test your KH. It measures 4° (4 KH). Look at the table at the pH and KH, and see where they intersect. This is the CO2 level — in this case 30ppm. However, we may misread our test kits, or they may be inaccurate. Liquid pH test kits rely on interpreting a colour chart and KH test kits rely on counting the amount of test kit liquid drops it takes to change the colour of the aquarium water in the test tube. If either parameter is misread or inaccurate by as little as 0.2 pH or 0.5 KH it can mean under or over readings. It’s possible to think you are reading 30ppm CO2, but it could be as much as 45ppm or higher and lethal to fish. Another factor can throw CO2 accuracy. The pH/KH/CO2 relationship assumes that carbonic acid from CO2 is the only acidifying compound, but this is not the case for most of us. Nitric acids, humic acids and other organic matter will all contribute to acidification of aquarium water. This will typically result in pH readings lower than the table assumes — resulting in a false CO2 calculation. Long-term gas monitoring has been around for many years and is arguably a much more accurate and convenient method for testing levels. The most common method is via drop checkers, which work by sitting inside the aquarium water. These are filled with a solution of water and pH reagent known as bromothymol blue. This is the pH test kit reagent supplied with low-range pH test kits (pH 6.0 to pH 7.6). Wide-range pH test kits are not suitable. As the gas in the water reacts with the bromo blue/water solution it changes solution colour, ranging from a dark blue, which is a high pH/low CO2, through to a yellow, which is low pH/high CO2. The best way to use a drop checker is to fill it with water of a known water chemistry. In our case, water with a KH of 4° (4KH) is perfect. This 4 KH reference solution allows us to monitor CO2 levels more accurately. Using a low-range pH test kit notice the lime green of pH 6.6 on the chart. We know by using the pH/KH/CO2 table that pH 6.6 with 4 KH gives us 30ppm CO2. So by aiming for that specific lime green in our drop checker we are aiming for 30ppm CO2. Any more blue than that lime green and there’s less than 30ppm CO2. More yellow means more than 30ppm CO2. Because the reference 4 KH solution in our drop checker is separated from our aquarium water via an air gap, the only influence on its pH is via CO2. This principle makes it more accurate and potentially safer than using the pH/KH/CO2 table and test kits. There are disadvantages to this method. The solution inside the drop checker can take several hours to change colour, so potentially misleading us into thinking that more gas is required. The larger the air gap between the aquarium water and the drop checker solution, and the more solution volume there is, the more time it will take. It also requires comparison to a colour chart, which can lead to misinterpretation. Be cautious and obtain a darker green rather than a yellow/green colour. In very large aquariums it’s not uncommon to use multiple drop checkers to ensure the CO2 is being distributed effectively around the aquarium. Move your drop checker around to determine your gas levels at all parts of your aquarium, especially in high-energy systems that require CO2 levels to be spot on. If you have a low-energy planted aquarium, such as low lighting and nutrient levels, then 30ppm CO2 is not necessary. The plants will be happy with such as 15ppm and this presents less risk to fish. To easily measure this with a drop checker just dilute the 4 KH solution with 50% RO water. This makes it 2 KH and at 15ppm the drop checker will be at the desired lime green colour. Cross refer to pH 6.6 on your low-range pH test kit colour chart. One of the best indicators of overdosing is to keep a close eye on your fish. Early symptoms include sluggish behaviour and loss of appetite. More severe symptoms will include gasping at the surface and unconsciousness. In such circumstances the most efficient way to reduce CO2 levels is to perform a large water change as soon as possible. Ensure the new water is approximately the same temperature and de-chlorinated to limit further stress. Agitating the surface by moving your filter outlet or adding an air stone will help, but these are not as effective as a rapid water change. The most likely time fish will incur gas intoxication is through the dark period when the plants respire and produce CO2 and use oxygen. For this reason have the CO2 injection turn off just before the lights extinguish. Many hobbyists choose to have their gas come on an hour or so prior to lighting. This enables levels to build up so the plants can begin photosynthesis earlier in the photoperiod. Some pressurised CO2 kits will dump a large amount of gas into the aquarium just before the cylinder empties. Change the cylinder before it reaches such a low level. There are glass or plastic types of all shapes and sizes, but they all use the same principle of holding a small volume of pH reagent/water solution that changes colour, depending on CO2 levels. Some drop checker instructions advise using aquarium water but, due to the huge variation in potential readings, if you have aquarium water with a KH of 10 it will take a lot more than 30ppm CO2 to move the colour into the green range. Dennerle and Cal Aqua supply a reference pH/KH solution ideal for adding straight into your drop checker, but it’s quite simple to make up your own reference pH/KH solutions. Buy a low-range pH test kit, and Nutrafin and API are two well-known brands, or you can buy bromothymol blue. I recommend buying a kit so you have the colour chart required to compare your drop checker colour with the pH 6.6 green indicated. You can either buy a ready-mixed 4KH reference solution, or make your own. Do so by adding 0.12 grams of baking soda and 1 l/1.8 pints of distilled water. These work using the principle that gas levels are linked to the aquarium water pH. A solenoid linked to a pH probe will turn the CO2 on and off, depending on a preset pH value determined by the aquarium water KH and by using the table. As mentioned earlier, CO2 is not the only factor to change pH levels. Due to the nature of most pH controllers the gas is turned on and off many times during a 24-hour photoperiod using a solenoid. You can also have the solenoid linked to the lights so CO2 is not wasted during darkness. The biggest potential issue with pH controllers is that they produce unstable CO2 levels commonly attributed to algae issues. They are also relatively expensive and the pH probe needs regular calibration. If the probe fails it’s possible for the CO2 to remain on continually, causing an overdose. In a high-energy planted aquarium with good light and regular nutrient dosing, the biggest cause of algae is poor or fluctuating CO2 levels. Rapidly growing plants depend on a stable source of carbon enrichment and adapt to conditions provided. If this source fluctuates or drops off during the photosynthetic process the plant will suffer and trigger algae growth. Dosing a liquid carbon fertiliser in conjunction with gas injection can help to address any carbon shortfall, but in the long term it’s better to provide an appropriate level of CO2 injection. In lower-energy systems, such as low lighting, injection can be replaced by liquid carbon dosing. 1. Get a drop checker, low-range pH test kit or bromothymol blue pH reagent, 4 KH reference solution, test tube and pipette or syringe. 2. Using the pipette or syringe add 4 KH solution to the test tube. Don’t fill to the line, as only a tiny amount is needed for the drop checker. 3. Add two drops of the bromo blue pH reagent to the 4 KH solution in the test tube. Note that its blue as no CO2 is present. 4. Then using the pipette or syringe once more, draw the solution out of the test tube. 5. Add the solution to the drop checker, using the pipette or syringe. 6. The drop checker is ready to be fitted. This model hangs on the side of the glass with the open end inside the water. George Farmer discovers itâ€™s hip to be square when he thinks abstract about his first moderately-sized cube aquarium designed for colourful community fish. I was rather reluctant to set up another tank at home. As an RAF servicemen and a six-month tour abroad pending, I was told by my wife not to take on any high maintenance aquariums. So with these instructions ringing in my ears — and at the request of my children who wanted a selection of active and colourful fish — the decision was simple. I’d opt for a low maintenance, yet high impact aquarium featuring minimal planting and colourful community fish. I like cube-shaped aquariums. Not only do they present more challenges than regular rectangular ones, but also offer more potential for creativity. Typically they will be viewed from three sides — front, left and right— so this needs to be considered when designing. One of the biggest problems with a relatively tall aquarium such like this is finding the right décor (hardscape) or plants to fill the space most effectively. I didn’t want to use many plants, due to their relatively highmaintenance, so hardscape would have to be the dominant factor. Luckily, I had recently received a shipment from a wood collector in the USA that was able to fit the bill perfectly. 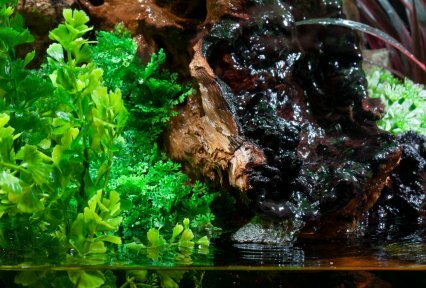 Manzanita wood is quickly becoming one of the most popular materials among aquascaping enthusiasts. However, it is still hard to get hold of over here, most having to be imported. Twisted and gnarly, it lends itself really well to most aquascapes — and it’s actually quite difficult not to create something very natural looking. It sinks after a few days of soaking and leeches few tannins when compared with other types of wood. Manzanita is commonly arranged poking upwards, as if it’s protruding from the substrate, but chose to do the exact opposite. I positioned the largest ends of the pieces uppermost with the thinner ends sinking into the substrate. The result looks really effective and creates many more hiding places for the fish. In the absence of heavy planting this helps the fish feel secure and that, in turn, makes them show off more. I always enjoy experimenting with new materials and when I saw some stone wood from J and K in the PFK office I knew I could use it. It has a very straight formation with a definite strata, so was quite easy to work with. The burnt orange colour offers a pleasing contrast with the black background and aquarium furniture. I find it really difficult to reject any thoughts of plants in a freshwater aquascape and this was no exception. It would also be a waste to use my usual suppliers as the postage would have probably cost more than the value of the plants I wanted to use. Instead I went on a trading forum where members can sell and buy excess plants. These represent a great idea and help save the hobbyist some cash. I don’t think the retailers have to suffer either, because by having bread and butter plants at this more accessible level helps to promote the hobby at the grass roots. As the hobbyist becomes more experienced he or she is more likely to progress to harder to find and more demanding plants — and this is where the retailer can step in. I put on a quick ‘wanted’ thread and within minutes had offers from Crinums to Amazon swords, and finally a Java fern. Special thanks to Julie Lightfoot who sent my Java fern at very short notice so that I could meet my deadline for completing this project. I usually find choosing fish quite easy. I generally only have one or two species in my aquariums, but with this being a community tank I would need several. A visit to The WaterZoo, my local retailer, left me overwhelmed with choice! I split the aquarium into surface, midwater and bottom dwellers and all the fish would have to be able to thrive in hard water, so I narrowed my options to those able to be kept in unadjusted mains water. Some dwarf Blue gouramis caught my attention and would provide great colour and interest at the surface. A group of Sunset platies with their yellow/red would contrast nicely with the blue and green of the Java fern. For midwater a shoal of Bleeding heart tetras would provide nice movement and class. A pair of Bolivian rams would look great nearer the bottom, with their fascinating behaviour and hardy nature making them suitable for my hardwater set-up. A shoal of Corydoras on the bottom would complete the picture. I had only kept these once before and I’d almost forgotten how adorable they are. Look out for a biotope project next year! When the aquarium, cabinet and equipment, supplied by ND Aquatics, arrived I immediately became aware that a 60cm/2’ cube is not particularly small. When most of us think of a two footer tank we probably imagine the classic 60 x 30 x 30cm/ 24 x 12 x 12”, but this cube holds around four times as much water! Built with 10mm/0.4” rimmed and braced float glass it’s heavy too. I could barely lift the aquarium onto its cabinet, let alone through my house. If attempting anything similar get some help. This is a perfect kind of set-up for beginners. It takes up relatively little space, considering the volume, and at more than 200 l/44 gal is big enough for a wide variety of community fish — as long as they are compatible and appropriately sized, even when adult. The eye-catching fish and striking décor create a pleasant focal point in any room. The Java fern is almost maintenance free and, longer term, I would likely add other low maintenance plants such as Anubias and crypts. This tank has received more visitor compliments than most of my other aquascapes and shows how colourful and active fish can perhaps attract a greater following than the relatively complex and much higher maintenance nature aquariums. 1. The set-up includes a 60cm/ 24” cube aquarium braced with 10mm float glass and black silicone. The black ash cabinet and hood are popular choices and also provided are a large external filter, 200w internal heater, twin T8 fluorescent controllers, submersible LED light, air pump, air stones, thermometer and 25kg of pea gravel. 2. I decided against the supplied Dorset pea gravel as it requires extensive pre-washing and raises the pH and hardness. Instead I’ve added 20kg of Unipac Fiji sand that’s been previously washed. It’s a fine quartz gravel with rounded grains, making it inert and suitable for the Corydoras catfish and their delicate barbels. 3. The quartz gravel is placed and then gently sloped up towards the rear of the aquarium to give the illusion of extra depth to the whole structure Only a thin layer is required in this case as there are no rooted plants. The aquarium has a painted black background so that saves me painting it and I’m using some black plastic filter pipes that blend nicely into the background. 4. The first piece of Manzanita is added. 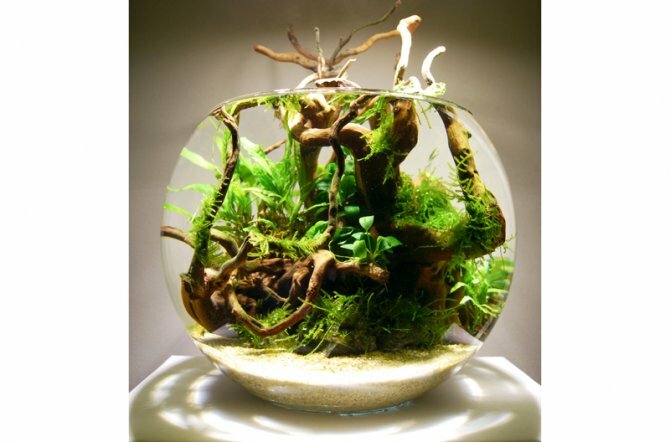 Most aquascapes based around branchy-style wood have the piece protruding with smallest ends uppermost. I have done the opposite and positioned the wood as if it’s fallen into a river or lake. The wood has been pre-soaked to ensure it sinks and tannin leeching is minimised. 5. More wood is added in a similar fashion. The overall effect looks natural and provides the fish with more places for shelter and offers them a greater feeling of security. The ends of the wood are placed into the substrate with the other ends resting gently against the glass. This positioning keeps the wood secure. 6. Stone wood is then added around the base of the wood. It’s colour and texture appears to complement the substrate and wood, and the pieces are positioned as naturally as possible. Why not experiment with your positioning? It’s worth taking some time to get all of the décor to your liking as best as possible at this stage before any planting and water filling. 7. Java fern is added around the wood. Because so many pieces of wood cross I place the rhizomes between the pieces and this holds everything. Over a few weeks the ferns will attach more securely. 8. Add de-chlorinated tapwater slowly via a colander. This prevents clouding and helps keep wood and ferns in place. My water is hard, so consider yours when picking fish. Stop the fern drying when filling, or it will die. 9. Once the aquarium is full I fit the other equipment. The internal heater is set to 25°C/77°F and large external filter primed. Although the external is new I have replaced its media with mature biological media. Otherwise I would have to perform fishless cycling to ensure the fish would not be exposed to toxic ammonia. 10. Once the aquarium water is up to the right temperature the fish are acclimatised as per the retailer recommendations and added to the set-up. Within minutes they seem to be very happy with life in their new surroundings and quickly provide genuine interest and entertainment to all visitors to my home — and of course my family! 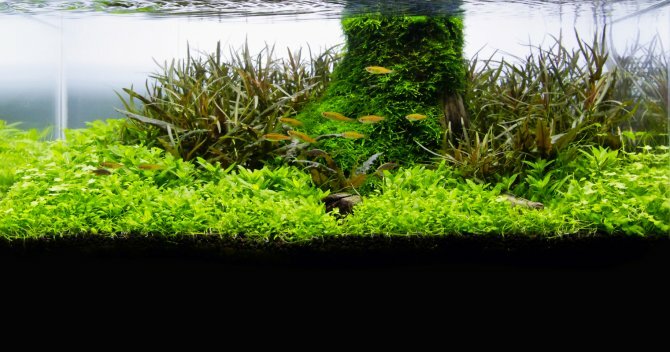 When designing a layout that’s viewable from two or more sides the most effective style of aquascape is the ‘island’ or ‘triangle’ composition. Always position your décor before filling the aquarium with water. This way you can spend as long as you wish ensuring you are entirely happy with the design without disturbing the substrate and clouding the water. Open substrate or short planting should be used at the front and left/right to give an effective transition to the focal point(s). Daily: Check fish health, feed fish, check temperature and filter function. Weekly: 25% water change minimum (if nitrates creep then change more), clean glass, vacuum substrate. Monthly: Clean half of filter media in old tank water. Alternatively each half of media every month. Clean glass cover glasses, braces and rims. Three-monthly: Clean filter hoses and pipe work, prune Java fern. ND Aquatics for the aquarium, cabinet and other equipment. The WaterZoo, Peterborough, for the fish. J and K Aquatics Ltd for the stone wood. Mike and Julie Lightfoot (UKAPS) for the Java fern. The equipment supplied by ND Aquatics was a nice surprise. It charged £530 for the entire set-up, which I believe is good value considering the high build quality and extras such as Arcadia lighting and TetraTec external filtration. James Starr-Marshall sets the stopwatch to create a completely new aquascape in under three hours. No matter how happy I am with my current aquascape, the desire to try new ideas will eventually outweigh the desire to keep it. My 20 l/4.4 gal tank had been running for more than nine months and although it had already undergone a change of planting and fish the hardscape had remained the same. It was time for a total re-scape! The old set-up (pictured above) was in excellent health and, despite minimal maintenance, was algae free. This was partly due to the fact that over time I had found the right balance of light, CO2 and nutrients. Not to be under estimated, however, is the importance of a mature substrate as I’m convinced that the benefits are huge — particularly where plant health is concerned. Given the right conditions an aquarium filter can be fully matured in four weeks, but it can take a long time for a full range of microbial life to establish itself in the substrate. Taking this into consideration, coupled with having no facilities to re-house my fish and shrimps, I decided to attempt the new 'scape while maintaining the maturity of the substrate and filter. The idea for my new scape came, as always, from observing the terrestrial environment, but this time I had no definite image to work to. Usually I look at a landscape or natural feature then try to stylise and emulate it. This design, however, was born from a more general premise of a blind summit. When approaching the crest of a hill at the edge of a valley, sometimes if the land on the other side is higher it can be seen before the summit is reached. The valley itself is hidden from view, yet the eye is still acutely aware of the distance between the visible areas. Would be possible to recreate this effect in the restrictive depth of a nano aquarium? To work, the idea would need attention to detail in several important areas. The summit of the foreground hill would have to strike a strong, crisp line and have plenty of clear space between it and the planting beyond. Any hardscape material or plant on the far side of the valley should have a much finer texture than that on the near side. The grown-in height of the chosen plants would also need to be accurately predicted to maintain minimal tolerances between foreground and background. Then, if the plantings on the near and far sides of the valley were to have an obvious colour differential, it would help to reinforce the separation between the sides. With these creative criteria and the technical constraint of maintaining maturity, I got going. The bulk of the planting would be Riccia fluitans and Vesicualria ferriei (Weeping moss) as these could be removed from my current tank and prepared in advance of moving fish from their present home. They are naturally floating plants, but best when attached to stones or wood. You can use ‘superglue’ type adhesive, cotton thread and fishing line, but I opted for hair nets. I placed a thin layer of plant on the chosen stone and laid the net over the top. On picking up the stone the net could be gathered beneath and tied off with fishing line. I tend to pull the net tight for moss, so that it will root to the stone. Leave it a little looser for Riccia so that new growth can develop under the net, as this plant will not take root. The plants were prepared on a plastic tray and kept wet throughout the process, after which they were covered with a plastic bag to help retain moisture. I keep both fauna and the filter healthy in a 16 l/3.5 gal auxiliary tank on a sturdy chair next to the main tank. Half the volume was syphoned from main to auxiliary tank and the filter inlet and outlet transferred. I now had a stable environment for my fish and shrimps while also keeping my filter bacteria alive. Once the fauna was moved and tank drained to below the surface of the substrate I figured I had some three hours before substrate maturity began to suffer. At this stage I tried to keep as much of the remaining water as possible to help refill the aquarium. The first step in the creative process was to mark out the valley in the substrate. The usual method of using a soft brush is inadvisable when the substrate is wet, as the brush will clog. Instead I used an old credit card, which is also useful for chopping up areas where the substrate has compacted. The main stones were placed, both of them Seiryu to keep consistency throughout the scape. However, the surface texture of the rear stone was much finer and more detailed than that of the near. I hoped this would create the illusion of a mountain peak on the far side of the valley. The pre-prepared moss stones were arranged at the rear to give the effect of a forest around the foot of the proposed mountain. I allowed for growth of about 1-1.5 cm/0.4-0.6” in height, to achieve the desired shape and proportions. Moss should be kept short to ensure the health of the plant. If Riccia is pruned too short it can become a bit patchy and re-grow unevenly. In the very foreground I planted some Hemmianthus Callitrichoides (HC) with tweezers. With careful pruning I hoped to achieve a textural fade of HC to Riccia to further enhance the effect of false perspective here. Riccia can be a very invasive plant so it will require regular pruning. The last plant added was Eleocharis parvula, a short variety of hair grass. This was planted at the near corner of the main stone to clearly define the foreground. For the same reason, some sand and graded gravels were also added. Happy with the design, I felt the scape was complete. I used the saved water to slowly refill the tank via an air line hose, trying not to disturb anything. The main tank was about one-third full, so I switched off the filter on the auxiliary tank and used six of the eight litres there to further fill the main tank. At this point I caught the fish and shrimps and returned them to their original home. There was no need to acclimatise them as I was using the same water. I could now top up the tank with dechlorinated tapwater and return the filter to work on the main tank. The fish and shrimps took a moment to explore their new surroundings, but settled quickly and soon looked as happy as they did before the change. I finished the project at 2.58pm. The tank was empty for one hour 58 minutes — and the total time taken, including plant preparation, was two hours, 52 minutes. Technically the project was a complete success. I suffered no fish and shrimp casualties, proving that the filter had maintained maturity. By the second week of the aquascape’s life I was convinced I had also maintained the maturity of the substrate, as I had not experienced the usual slime algae outbreak associated with a new tank. I experienced no algae issues during the entire ten weeks it took to grow in the ‘scape. However, I felt the creative aspect could have worked better, as the illusion only worked when the tank was viewed directly from the front. The fish threw the scale into disarray unless all were present at very front. Minimal tolerances between the height of foreground and background plants also became a pruning nightmare. What’s in the new set-up? Fancy giving your plants a real energy boost? George Farmer takes a detailed look at what CO2 injection can do for the growing potential of your planted aquarium. I started my first planted aquarium in 2003 and it was a dismal failure. Most of the plants were non-aquatic and I was given some pretty poor advice. Fast forward one year and I learned about CO2 injection! I made my own yeast-based CO2 system and never looked back. Growing plants became easy and I was throwing away unwanted handfuls every week. As I became more experienced I invested in a high-end pressurised system that’s still running today. CO2 injection is considered essential for many species and it will improve growth in the easiest plants too. Combined with appropriate lighting and other nutrients, if you get your gas levels and distribution correct you can easily grow whatever plants you want. Carbon dioxide is essential for the growth of plants. They use it as their main source of carbon and if the level is deliberately increased via injection then growth will increase accordingly. Converting the gas and light into plant growth is known as photosynthesis and, with appropriate lighting, injection and other nutrients, this process, known as pearling, can be visible as oxygen bubbles forming on the plant leaves. Even a small increase in CO2 will improve plant growth, but the level must remain stable while the plants are under illumination, otherwise algae will proliferate. In aquaria with high lighting levels this gas is essential, plants being otherwise unable to cope with the rate of photosynthesis demanded. This, in turn, leads to poorly plants and algae issues. The same principle can be applied to other nutrients. With good light and CO2, plenty of other nutrients are necessary to feed the plants effectively, promote healthy growth and prevent algae. CO2 is toxic to livestock so never add too much. In the planted tank hobby overdosing is the biggest killer of fish and shrimp, so monitor levels effectively. Pressurised cylinders contain the gas stored at almost 1,000psi, so keep them well out of reach of inquisitive children and any pets. 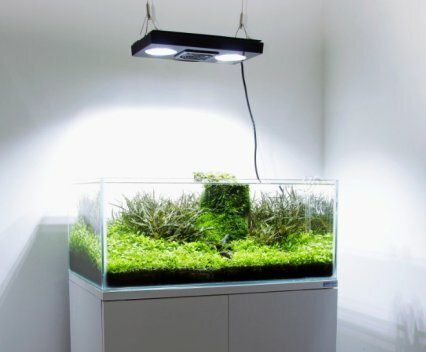 What type of CO2 system is for you? Yeast-based: This relies on a mix of yeast, sugar and water to create gas as a by-product. This happens in a sealed container, like a soft drinks bottle, and the CO2 is delivered to the aquarium via an air line or tube. Only by altering the ratios of your ingredients can you change the gas output. Ambient temperature also plays a part — the warmer the mixture, the more is produced, but for less time. Pros: Inexpensive to set up and run. Suitable for smaller aquariums. Cons: Uncontrollable and unstable CO2 levels. Unsuitable for larger aquariums. Aerosol: Squeeze the trigger of this small disposable pressurised container to deliver the gas. A CO2 diffuser sits inside the aquarium and fills with gas. Release the trigger once the diffuser is full, then for the next few hours the gas diffuses into the water. Once the diffuser reservoir is empty re-use the aerosol. Pros: Inexpensive to buy. Easy to use. Suitable for nano aquariums. Needs monitoring. Can’t be left to run unattended for long periods. Cons: Unsuitable for larger aquariums. No adjustment possible. Pressurised: A basic system consists of a pressurised cylinder, regulator and diffuser. Solenoids can be fitted to have the CO2 switched off at night and a pH controller can maintain a stable level. A needle valve and bubble counter can determine the rate of the CO2 being added and a non-return valve prevents any water damaging the regulator. Regulators can vary. Higher-end models have two dials; a contents gauge and a working pressure gauge that can be adjusted. A full cylinder will contain the gas at around 60 bar (870 psi) and the regulator reduces this pressure to a working one bar (14.5 psi). Some diffusers need a higher working pressure due to their tight, porous ceramic structure. The gas is then delivered to the aquarium via some form of diffuser or reactor. Pros: Controllable and stable. Customisable for any aquarium size. Can be fully automated. Good value if using refillable cylinders. Cons: Initially more expensive. Can be easy to overdose. Potentially dangerous high pressure levels. This is perhaps the most basic diffuser. Gas bubbles enter the bottom of a ladder-type device, rise through the rungs and dissolve into the water. The ladder also doubles as a bubble counter and at a glance it’s obvious how much CO2 has been injected. Expect to pay around £10 or more. Gas builds up behind a ceramic disc which has tiny pores that allow a small path of gas to flow through. When underwater this produces CO2 micro-bubbles or mist, and the smaller bubbles the better as these dissolve more easily. However, they are fragile so be careful when handling and disc quality can vary from model to model. Some can emit micro-bubbles from only a small proportion of surface area and bubbles can be large. Others will emit a consistent quantity of tiny ones throughout the surface. There’s no guarantee which you’ll get, so buy several of the cheapest models to ensure that at least one will be good for you. Ceramic discs are unsuitable for most yeast-based and aerosol systems as will they require a higher pressure. Clean them by soaking in bleach or a limescale remover weekly to ensure the pores don’t get blocked, resulting in poor or large micro-bubble production. Prices range from £3 to more than £100. These are becoming the diffuser of choice for many in the hobby. The principle is the same as the ceramic disc, but the device is installed inline with the filter outlet. An external canister filter is required. Cut the outlet hose near the outlet end, spray bar or lily pipe, and position the diffuser by attaching it inline. The gas hose is attached to the diffuser with the micro-bubbles being immediately picked up by the flow and then blasted around the aquarium. There’s little cleaning required with this method because the device is on the filter outlet and little or no light reaches the ceramics, so preventing any algae build-up. Expect to pay in the region of £15. These are also fitted inline to an external filter, being relatively large and usually positioned inside the aquarium cabinet. They work on the same principle as the inline diffuser, but instead of micro-bubble production the gas is completely dissolved in the reactor. They are usually filled with bioballs or similar to help dissolve the gas. There are no visible bubbles produced, but many models can restrict flow. Expect to pay around £50. Up to 30ppm CO2 is considered safe for most fish and shrimp, but some species are more susceptible to intoxication than others. Fish from oxygen-rich environments are usually the most sensitive. Ensure oxygen levels are good, as well as gas levels. I do this by ensuring there’s always a good amount of surface movement on the water. You will use more gas, but the trade-off is worth it for the sake of your fish. It’s also worth investing in a solenoid if you have a pressurised system. Have it switch on your CO2 one hour prior to lighting and off one hour before the end of the photoperiod. This way the gas should be at a level to promote growth as soon as the lights are on and suitably low when the lights are off. At night the plants produce CO2 and use oxygen, so observe your fish late at night and first thing in the morning, especially when first setting up a system. When adding new fish to an injected aquarium consider turning off your lights and gas 24 hours prior to addition. This will ensure that the fish won’t be shocked by high gas levels. Large water changes are the best way to quickly reduce CO2 levels in the event of emergencies. Test the aquarium water for pH and KH and cross-refer the results to a table for a CO2 level. However, using the table assumes that the only acid in your water is carbonic acid that’s produced from the gas, when many other factors affect aquarium pH. For this reason another testing method has become popular using a CO2 indicator or drop checker. This device sits inside the aquarium, being filled with a solution of water that’s exactly KH 4 (4 KH water) and a pH reagent called bromothylene blue (also found in low-range pH test kits). The gas reacts with the solution and changes colour according to how much is present. The aim is to get a nice lime green colour which equates to 30ppm CO2, which is regarded as safe in most situations. If you have a low-range pH test kit then look at the colour that pH 6.6 gives. That’s the green you’re after in your drop checker. Expect to pay around £5 for a drop checker, £5 for a low-range pH test kit (bromo blue) and £5 for some 4dKH water. Dean Barratt has followed up his first PFK featured plastic planted tank by giving a paludarium the same synthetic treatment â€” and he didnâ€™t disappoint Jeremy Gay. Wow, he’s done it again! That’s what I thought when I first laid eyes on Dean Barratt’s latest creation. 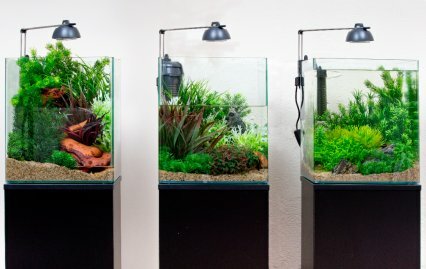 Love or loathe plastic plants, this guy really knows how to use them — and since he’s been regularly creating such tanks with instant impact yet massive longevity, I’ve become a massive fan. When Rosewood’s Dean created his first tank for us — a 1.2m/4’ aquarium furnished with Sydeco plastic plants as featured in our March 2011 issue — everyone loved it. As a result I gave him an open invitation to return with more ideas. His next tank is a paludarium, again using plants from the Sydeco range. This is breaking new ground as far as I’m concerned, as the only decent paludariums I have seen had live plants in them. Those that didn’t looked pretty naff. I think you’ll agree that this set-up looks superb! This isn’t a sales pitch but plastic plants do have many advantages, especially for those who can’t grow live plants for various reasons, or for those who simply don’t want or can’t have them. Advantage number one: Plastic plants are not light dependent and won’t ever need feeding, any pruning or replanting. Advantage number two: You can keep them with fish that would usually eat live plants, like large cichlids or Silver dollars. Advantage number three: They last for ever, so get them looking good from day one and, bar the odd, thorough clean, they will keep their shape and looks for as long as you want them to. Growing live plants in a terrarium or paludarium can be pretty tricky. They need the right humidity and nutrients, and we struggle just to get hold of the range of terrarium plants in the UK that they enjoy in paludarium heartland of Europe, particularly Holland. With paludariums you get to keep life above the waterline too, so frogs are possible, as are terrapins in large ones with no fish or crabs. Terrapins or crabs would make a right mess of live plants in no time, yet with plastic a nicely decorated tank is a real possibility. And what about brackish creatures? Say hello to mudskippers, fiddler crabs, Anableps and archer fish in a natural type environment with perches and over hanging foliage. Yet there’s no die-off due to the salt levels in the water. Are you sold on plastic yet? So what makes this paludarium look so good? I put it down to a number of factors. Firstly Dean clearly has an eye for design and, like our own George Farmer, references the rule of two-thirds, focal points and how the eye is drawn through his designs. He has also heavily decorated the tank. In nine out of ten effective displays heavy use of decoration is employed and fish and décor are added and displayed in groups for even greater visual effect. Dean has also been brave enough to try new things. It takes a leap of faith to buck convention and turn a submerse aquatic plant replica into a rooftop hanging creeper just by hanging it upside down — or make a seaweed replica into a terrestrial fern replica by jutting it from exposed wood and on its side. Experiment with your own décor and it may just pay off! Then there was the tank itself. Dean talked at length with the PFK team as he wanted a tall tank that would properly complement his design. Several options were rejected as he just didn’t like the look of them and the way they would frame his creation. He settled on a new design from Maidenhead Aquatics; a 122 x 46 x 76cm/48 x 18 x 30” from its new Phoenix range and in a new colour called Mira Cosa. At 30” tall it allows for a decent water height, yet there’s still two-thirds of the design out of the water — and with that neat black silicone and glossy yet minimalist cabinet design it really looks the business. Three of us were admiring the tank on the day of the photoshoot and we were all eyeing up that cabinet. I even measured up for one when I got home! This tank even has an Optiwhite, low iron, ultra clear glass front and with this, and the AquaOak range, Maidenhead’s tank selection is evolving very much for the better. Every paludarium needs a waterfall, and Dean created one very simply but effectively from a single large piece of Mopani wood. The underside becomes a natural waterway, so when placed upside down and fed with water, it all cascades down the grooves in the wood, making a pleasing trickling sound as it goes. The water feed is simply the outlet from the external filter, so the filter still works in exactly the same way as if the tank was full — only this time the water takes a far more scenic route back to the fish below. You can make waterfalls in several ways — just by piling up rocks, wood or both — and if you don’t want to use an external filter you could use a powerhead and some PVC tubing, or an internal power filter on its back, again connected to tubing. An inline tap may come in handy, as it will allow you to control the water flow and prevent too much splashing. Dean chose a small shoal of Trigonostigma hengeli for this one, Known as Copper harlequin rasboras, they suit the shallow, tannin-stained water and are active yet tightly shoaling swimmers. Perfect for what he wanted. Other options included Cherry barbs or even platies. As long as the fish are small and in single species groups it should all look visually appealing. Dean feels that the whole design could go wrong if those setting up added too many types of fish and in low numbers. The same could happen with plants and the whole design could become bitty or too busy and uneasy on the eye. It goes without saying that, as with any aquarium, the filter should be properly mature before adding any fish. Tank: 122 x 46 x 76cm/48 x 18 x 30” Phoenix. Cabinet in Mira Cosa systemised 76cm/30” black or blue background comes as standard — £1,020 marine or £965 freshwater. 1. The first stage and one of the cleverest bits! Dean uses small plastic tanks, placed upside down, to create a raised area. 2. Large mopani wood is strategically placed to create the waterfall, with petrified wood placed around it. 3. More wood goes down, hiding the tanks behind. The hardscape is now all in place. 4. Large plastic plants are added. One is hung upside, two more are bunched together and jut out. A third rises up in the other corner. 5. More plants are hung upside down, and smaller, textured plants start to fill the midground. Plant in groups for effect. 6. Water is added along with more plants to fill out the design. Tannins from the wood stain the water, but it looks good. Don’t under-decorate. A few plants won’t give that lush effect and it won’t look so good. Leave the foggers out! A perhaps “natural” progression would be to add a fogger device to this sort of set-up, but Dean worked with them for years when in retail and prefers otherwise. Add hanging plants. For a really different effect you could hang plants, either wedging the resin bases above the stress bars or by cutting the plants and holding them in place with air line suckers. Do it dry first. This gives you the advantage of doing 90% of the work before the water goes in. Take your time choosing wood. Dean’s piece is perfect, but he says he would have otherwise used cork bark, slate or bank the rocks up more. He used the external filter to create the waterfall, but you could use a separate powerhead and some flexible tubing. Keep it simple with fish. Stick to one two or three species. Too many will make the whole design appear fractured and bitty. Catfish would be good on the bottom and obviously keep species size small because of the limited water volume. It’s worth experimenting. Dean used some of the Sydeco plant range that he doesn’t usually choose and left out some he normally likes. They combined well. He normally uses Atoll maxi, but it didn’t look right. He then tried Coral bush and it looked like asparagus fern. He also found that using mostly green and just a few bits of red worked best, probably to create that jungle effect. He also used some of the range with small flowers on — items he normally wouldn’t do with a full aquatic scene. Use the rule of thirds and give thought to the depth of tank above the water, front to back. Tier the plants and aquascape to lead the eye. Dean loves the valley effect, leading the eye and mirroring the cascade effect of the waterfall on one side of the valley with plants on the other side. He also brought terrestrial décor forward so there’s space behind it, giving it the effect of reaching for infinity. Check out our video of the finished set-up. See Dean's original article for PFK: How to set up an aquarium with plastic plants. George Farmer re-uses an existing rock layout to create an even more impressive aquascape with some state-of-the-art equipment. It’s a shame to break down an aquascape when you’re really happy with the design. Even after many set-ups I have created and stripped for similar step-by-step features, it can still pain me to do so. The rock-based iwagumi featured in PFK in 2010 was one of my strongest and, rather that destroy it, I used the opportunity to try out some creative plant re-arrangement — a technique known in Japan as Sozo Haishoku. The principle is to keep the same rocks, but rearrange and replace the plants. By also changing the background and fish it’s possible to create a completely different look without the effort and expense of changing décor. The original design (pictured above) was minimal, with just Eleocharis acicularis (Hairgrass) dotted around the rocks. I wanted to retain some, as it’s an excellent choice in a small aquarium, being easy to grow and maintain. Sprigs poking up between rocks look really natural. I re-planted plenty of spare from the rear of the tank to along the sides. Mixed with it I planted some donated Echinodorus tennelus to give added texture. Towards the centre I planted a mix of crypts taken from my other planted aquariums — including C. wendtii ‘green’, C. wendtii ‘brown’, C. parva and C. willisii. The broader leaves and different colours add further interest. Small portions of the new Hygrophila pinnatifida were added to the foreground. Among the crypts some Microsorum pteropus ‘needle’ was attached to the rocks. This is slow growing, along with the crypts, and complements their leaf shape. A background plant was needed to achieve a different look. A stem was the obvious choice, so I tried Rotala sp. ‘green’, again donated. This was intended to grow up, forward, and drape across the rocks. Unfortunately it grew straight up. I therefore replaced it with Ludwigia arcuata and hoped for the orange/red effect it can produce. The colour transition was not to happen, but the plant still looks great when green. Some Hydrocotyle sp. ‘Japan’ was added to the foreground edges. This is new to the UK and has lots of potential. When I saw PFK editor Jeremy Gay’s super shallow rimless planted tank lit with the TMC 1000ND LED tiles I wanted to try them for myself. He successfully grew a carpet of Glossostigma in weeks, so I was confident I wouldn’t have any issues either. I hadn’t used suspended lighting before and was thankful that the joists in my kitchen ceiling were positioned appropriately above the aquarium. The units looked great— perfectly suiting the effect I strived for. Maintenance is so much simpler without having to tilt a luminaire or remove a hood. I swapped the filter outlet lily pipe for a ‘poppy’ type that deliberately agitates the surface. This, combined with the point source effect of the LEDs, produces brilliant glitter lines. CO2 consumption is slightly higher due to the agitation, but the trade-off is worth it. Due to the high PAR produced by the LED units I was concerned about having too much light, potentially resulting in an algae bloom. The LEDs are adjustable from 0 to 100% in 1% increments, so by measuring the lighting with a PAR meter I could find out what height above the water and what power I needed to set. A level of 30μmol at the substrate is enough light to grow all the plants in my aquarium, which equated to 65% output with the units suspended 30cm/12” from the surface. I set the photoperiod to seven hours with a ten-minute ramp up and down at each end to avoid startling the fish. Controller units remember all the settings and time, even after power has been disconnected for some time. The colour rendition of the LEDs is less saturated and vibrant than some T5 fluorescents, but the glitter lines and natural appearance more than compensate. I also like the fact that there’s relatively little light spill compared with something like a metal halide, so there’s less glare and algae build-up on the glass. The 60cm/24” cabinet is packed with technology. Not only are there LED controllers but I’m now using a Fluval G6. This is the easiest to maintain filter I’ve used and I’ve only had to clean the main biological media once in six months. I clean the mechanical pre-filter every week to ensure flow rate is maximised — a job that takes seconds and I don’t need to turn off the filter. The conductivity meter has also proved useful as I know that the mini landscape rock considerably increases water hardness. Over a seven-day period it will rise from 750μS after a large water change to almost 900. The CO2 unit consists of a 2kg fire extinguisher, solenoid, bubble counter and Boyu inline gas diffuser. There’s also a Hydor external inline heater. All this kit in the cabinet means there’s none in the aquarium and only the glass lily pipe inlet and outlets are displayed, resulting in minimal impact on the aquascape. I’m also using new fertilisers from Aqua Rebel in Germany. Its most interesting product is called Spezial-N, containing lots of different nitrogen compounds and over the last three months the results have been impressive. The original aquascape is due an overhaul. Rather than replacing the rocks and substrate, they’re kept in place and the plants, fish and background are changed. The hairgrass is removed from the rear and sides. Pulling it up tends to bring it all up at once, due to tangled roots. The plants are either saved for re-planting later or sent to colleagues. 3. Hello to the crypts! The crypts are planted in between the rocks in the midground. These were removed from my other two planted tanks at home. All the plants in the new aquascape are from existing planted tanks. More hairgrass and some stem plants are to be added. Soon lighting is changed to LED and a new filter added. The Neon tetras are added to another planted tank, and replaced by Pretty tetras. What plants are in there? Notes: This lovely tetra is often kept in community tanks, but to do it justice needs to be kept in large shoals. A heavily planted tank with lots of cover and a good diet will promote good colours. Turn off your filter and remove a third of the aquarium water. Using an old toothbrush or metal-wired brush for more stubborn algae, scrub the rocks until clean. Remove another third of the aquarium water. Top up with fresh dechlorinated water, ensuring it’s the right temperature. Nerite snails are effective algae eaters and should help to keep your rocks clean. However, they can lay hard to remove eggs, so consider this before purchase. 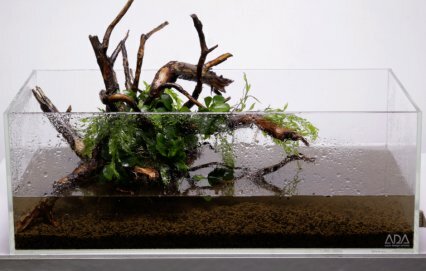 Are you sick of Iwagumi? 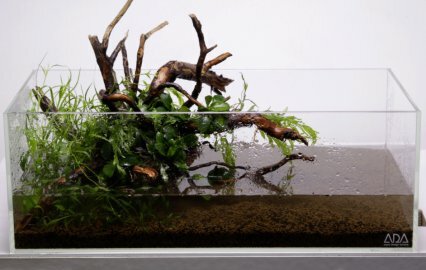 Iwagumi aquascapes are still very popular — I think for a couple of reasons. Some enthusiasts love them for their simplicity. They can add a few rocks, one or two species of plants and have an easy aquascape. However, perhaps these are not the most fish-friendly of aquariums. Usually there’s little plant cover, few hiding spaces and bright lights. Add tall plants to the background to provide some security. Floating plants could even be used. As the rocks become more hidden by the plants, the aquascape softens and looks even more natural. Attach some moss or ferns to the rocks too. The more plants there are, the more oxygen is produced and the more efficient the nutrient removal and algae prevention.